The John Coombe fireplace, shown left © Exeter Archaeology, is widely regarded one of Exeter's most important surviving medieval artifacts. It now languishes in the store room at the Royal Albert Memorial Museum in Queen Street, detached from the building for which it was created. It's worth stating from the start that the fireplace is also one of the city's most enigmatic objects. A recent discovery in the archives of the Royal Academy in London has solved one of its mysteries but the discovery has inadvertently created many more. The object of this post will be to give a short account of the known facts about the fireplace before discussing some of many unanswered questions which surrounded it. Along with the dean, treasurer and chancellor, the precentor was one of the cathedral's four senior ecclesiastical positions. As the lead chanter, the precentor was responsible for music and liturgy and, at Exeter at least, he was also acting president of the chapter in the dean's absence. The precentor had his own residence within the Cathedral Precinct. Located close to the Bishop's Palace in Palace Gate, it was known as the Chantry and the precentor at the close of the 15th century was John Coombe. It is believed that between 1496 and 1499 John Coombe commissioned a fireplace to be installed in the great hall of the Chantry. It wasn't without precendent. Elaborate fireplaces were installed within a number of Exeter's ecclesiasical residences in the late 15th and early 16th centuries. There was one in the refectory hall of the College of the Vicars Choral, at least four at the Deanery (some of which survive as fragments), one in the hall of the Annuellars in the Cathedral Close, one at the Archdeacon of Exeter's house in Palace Gate, another at the Chancellor's House and, most spectacularly of all, a huge fireplace in the Bishop's Palace. The Courtenay fireplace at the Bishop's Palace above right is one of the most extravagant things of its kind. It was commissioned by Bishop Peter Courtenay in c1486. Described by Pevsner and Cherry as "exceedingly ostentatious", its impact was such that Bishop Courtenay's example seems to have served as a model for Precentor Coombe's own fireplace. 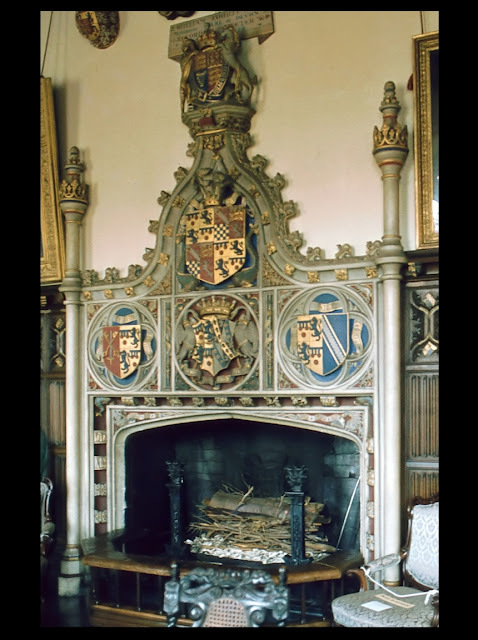 The Courtenay fireplace, originally positioned in the west wing of the Bishop's Palace, is studded with brightly painted heraldic shields, a number of which depict the Courtenay coat of arms. 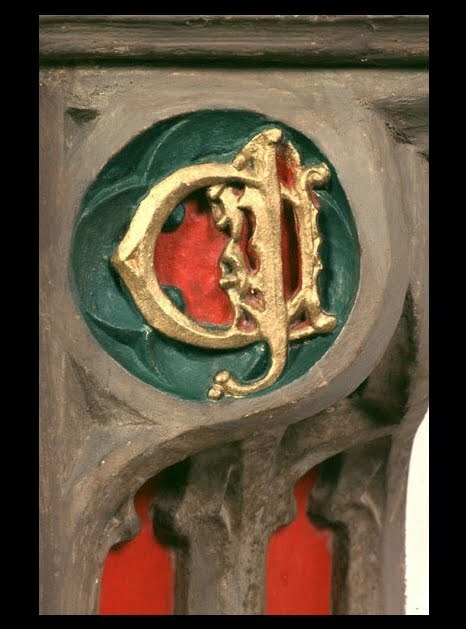 Another feature are the initials 'PC' and the letter 'T', believed to stand for 'Tau', the badge of the Hospital of St Anthony in London of which Bishop Courtenay was the Master. Perhaps most striking of all is the huge, ornately decorated ogee-headed canopy with rose-bush finials at either side. At the apex of the canopy, 12ft above the ground, is a large depiction of the Royal arms with the greyhound supporters associated with Henry VII. It is an extraordinary creation and must've been marvelled at by every member of the clergy who saw it. A close copy of the Courtenay fireplace was installed in the dining room of Powderham Castle, the seat of the Earls of Devon, in the 19th century left. The heraldic details are quite different, as are the finials, but it gives a good idea of the scale and splendour of Peter Courtenay's medieval original at the Bishop's Palace in Exeter (which isn't open to the public). It's almost certain that all of the lavish medieval fireplaces installed in Exeter were the work of local masons, probably those already being employed to work on the cathedral. The John Coombe fireplace in the Royal Albert Memorial Museum is largely made from the creamy-grey limestone quarried from Beer in East Devon. Spanning the two side panels of the John Coombe fireplace is the lintel. It is intricately carved with a star-shaped lattice pattern. There are two heraldic shields on the lintel: the left shield depicts the stag's head of the Dean of Exeter. The right shield possibly depicts the coat of arms of either Bishop Brewer or Bishop Stapledon, both Bishops of Exeter in the medieval period. Running around the top of the lintel are carved angels with outstretched wings. The fireplace is framed by a slender stone shaft which rises from the ground on each side and is capped with a short pinnacle. Between the pinnacles run a number of fleur-de-lis. The fireplace remained in the Chantry until the building was demolished in 1870. According to Lega-Weekes, the fireplace was salvaged, placed inside a packing case and left in a stable until was it purchased by a stonemason. In c1900 the fireplace was installed in the Deanery by Dean Earle where it remained until the early 1970s. The present paint scheme seen on the fireplace is the handiwork of a later Dean's son who painted it in the 1960s. The Deanery underwent various modifications between 1971 and 1972 and during the course of the building works the cathedral's own surveyor, Peter Gundry, came to the conclusion that the fireplace was Victorian. What happened next is the subject of some debate. It has been claimed that the fireplace was crow-barred from the wall and thrown out of the window where it fell onto a rockery and smashed into pieces. Alternatively, it has also been said that when the component parts of the fireplace were collected from Exeter University, where it was eventually taken, there was no sign of damage or even dirt. Some of those involved at the time can recall visiting the Deanery and seeing the fireplace sat in the garden seemingly undamaged. Interestingly, when the fireplace was removed from the Deanery left, the remains of a second elaborate fireplace of Beer stone were discovered behind it. 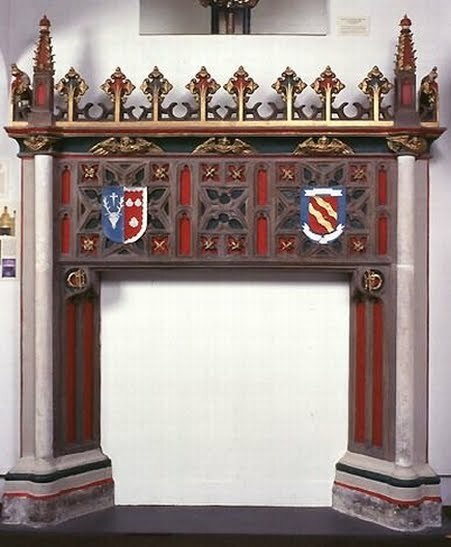 Professor Michael Swanton took the John Coombe fireplace to Exeter University in the hope of installing it there when the Dean and Chapter showed no interest in keeping it. The fireplace wasn't installed at the university, or at Bowhill on the outskirts of the city as had been suggested. Instead John Allan of Exeter Archaeology eventually secured the fireplace for the Royal Albert Memorial Museum in Queen Street where, until recently, it has been on display to the general public. That is not quite the end of the story however. In 1923 the antiquarian Ethel Lega-Weekes raised the possibility that there were in fact two ornate fireplaces installed in the Chantry at the end of the 15th century. One was the John Coombe fireplace now in the museum and the other was presumed to be missing, perhaps destroyed when the building was demolished in 1870. The idea of the missing fireplace has persisted to the present day. The museum's website still claims that the Chantry "had two very elaborate late medieval fireplaces, one of which is now lost", but the mystery of the missing fireplace can now be solved. The impetus behind the theory of the two fireplaces is a passage in George Oliver's 1861 book 'Lives of the Bishops of Exeter'. 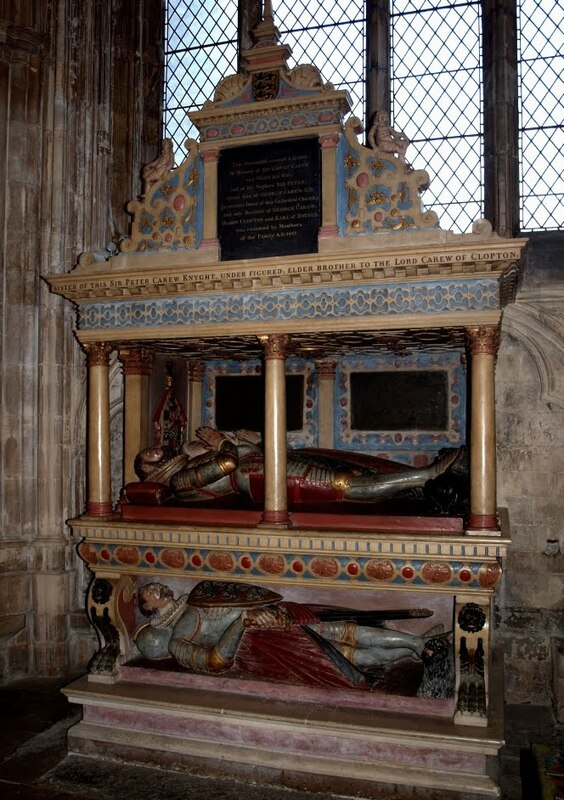 In the book he describes in some detail a "stately mantelpiece" in the great hall of the Chantry. The fireplace he describes is significantly different to the one which is now known as the John Coombe fireplace. This disparity led Lega-Weekes and others to believe that a second fireplace must've once existed. 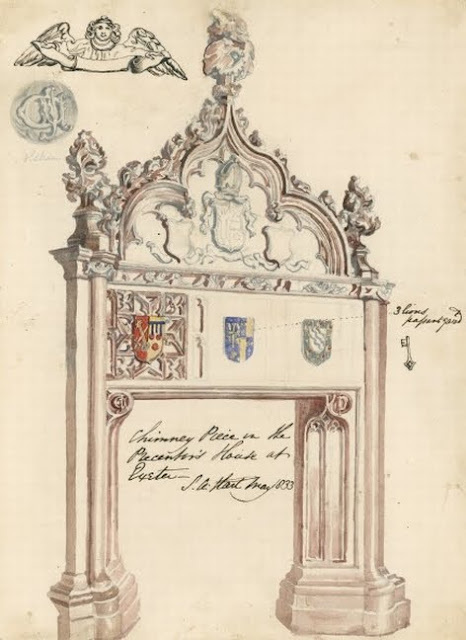 According to Oliver, the 'missing' fireplace was modified between 1747 and 1762 by Precentor Milles who repainted it and "surmounted it with the arms of his family". Oliver describes ten complete armorial bearings on the fireplace whereas the John Coombe fireplace in the museum today only has two, only one of which remotely matches Oliver's description. Oliver also describes various "mouldings" which don't fit with the surviving Chantry fireplace. In fact, apart from Oliver mentioning the presence of John Coombe's initials, almost nothing in his description can be matched to the John Coombe fireplace as it exists today. The drawing above right © Royal Academy, was recently discovered in the archives of the Royal Academy in London. It is labelled 'Chimney Piece in the Precentor's House at Exeter'. It was executed by Solomon Hart and is dated May 1833. The fireplace in the drawing is remarkably elaborate. There are three shields on the lintel and it is topped with a highly ornate ogee-headed canopy with three ornate finials. Inset into the canopy are three more shields, one of which is surmounted by a three-dimensional bishop's mitre. Above the lintel are a series of carved winged angels, framed by slender shafts which rise on each side. Its kinship with the Courtenay fireplace at the Bishop's Palace is striking. This drawing depicts the allegedly missing Chantry fireplace which was previously only known from George Oliver's description. 1: "1st - Of Canterbury, impaled with Potter's". This matches the 1833 drawing exactly. Precentor Milles's father-in-law was Dr John Potter, the Archbishop of Canterbury between 1737 and 1747. 2: "The Precentor of Exeter's... Impaled with Milles's". This bearing wasn't depicted in the 1833 drawing. 3: "Milles's impaled with Potter's". This bearing also wasn't depicted in the 1833 drawing. None of the details of the next four bearings were included in the 1833 sketch. 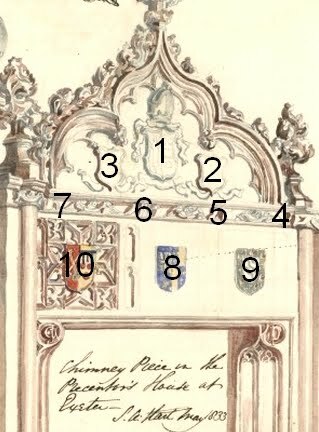 At first glance it's difficult even to locate their position on the drawing but Oliver described the heraldry on the fireplace from top to bottom and these four were "on the deep moulding". 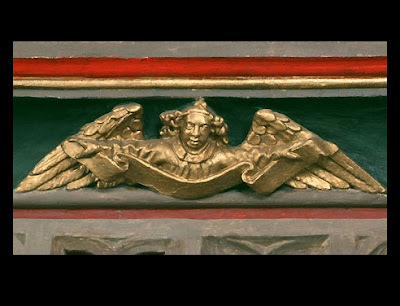 The only place where the four coats of arms could've been located was between three of the winged angels on the lintel. 4: "Precentor's impaled with Roger Keys's". 5: "Bishop Grandisson's". 6: "Bishop Lacy's". 7: "Precentor's and John Coombe's". The three shields on the main lintel, "below the mouldings", are the last to be described. 8: "In the centre. 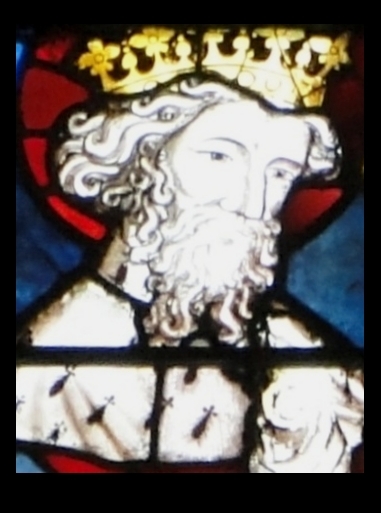 The arms of St. Edward, King and Confessor, as adopted by Richard II". This bearing consists of five gold marlets surrounding a cross impaled with the arms of the Plantagenet Kings of England, exactly as drawn by Solomon Hart in 1833. Oliver gets the last two coats of arms mixed up. He describes 9 as "Dexter - The see of Exeter impaled with Courtenay". This is actually the coat of arms to the far left at position No. 10. It matches the central armorial bearing on the Courtenay fireplace in the Bishop's Palace exactly. Oliver describes 10 as "three bends wavy" and he believed it was supposed to represent either the heraldry of either Brewer or Stapledon, both medieval Bishops of Exeter. Its correct position was at No. 9, as drawn by Hart. 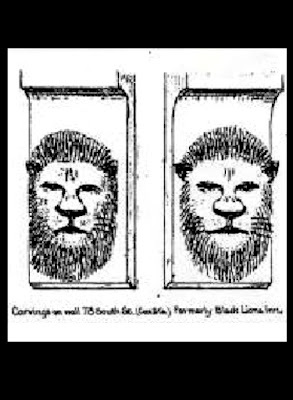 Even more interesting is the fact that the drawing also proves that there never was a missing Chantry fireplace. The fireplace drawn by Solomon Hart in 1833, and described by George Oliver in 1861, and the John Coombe fireplace now in the museum are one and the same. Compared with the photograph of the John Coombe fireplace at the top of this post, the one in the drawing looks completely different. There's no sign of the huge ogee-headed canopy on the fireplace today and eight of Oliver's armorial bearings are missing. But there are numerous points of similiarity, two of which are shown in the image right. In the drawing, the initials 'JC' are present in the corners above identical side panels in exactly the same form as they appear on the fireplace in the museum. The lattice decoration on the lintel is, in places, exactly the same. The winged angels at the top of the lintel are also very similar as are the two framing stone shafts. The 1833 drawing strongly suggests that at some point in its history the John Coombe fireplace was heavily modified and transformed from the fireplace drawn by Hart and described by Oliver into the now almost unrecognisible fireplace in the museum. But when did this occur? A photograph of the fireplace still in situ at the Chantry just prior to the building's demolition in 1870 shows that the current arrangement of the fleur-de-lis and pinnacles along the top was already present before the fireplace was removed from the Chantry. George Oliver's 'Lives of the Bishops of Exeter', which contains his description of the fireplace, was published in 1861, the same year that George Oliver died. It's possible that the description was made from notes taken some time before the book was published but it seems likely that the alterations took place between c1860 and 1870. This is when the difficulties in interpreting the John Coombe fireplace as it exists today start to mount up with startling rapidity. 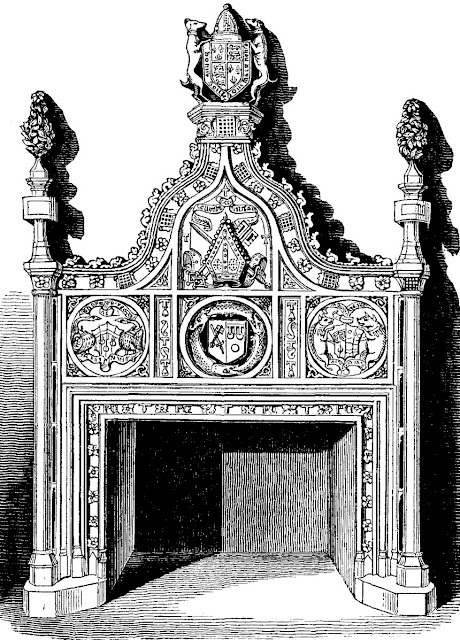 To return to the 1833 drawing, it is simply not known whether it depicts the medieval form of the fireplace as it was installed by John Coombe in the Chantry between 1496 and 1499. The Chantry was sold in 1655 during the Commonwealth and possibly used as a hospital. Did the John Coombe fireplace sit in the great hall completely unaltered throughout this turbulent period? What condition was it in when the additions were made by Precentor Milles? 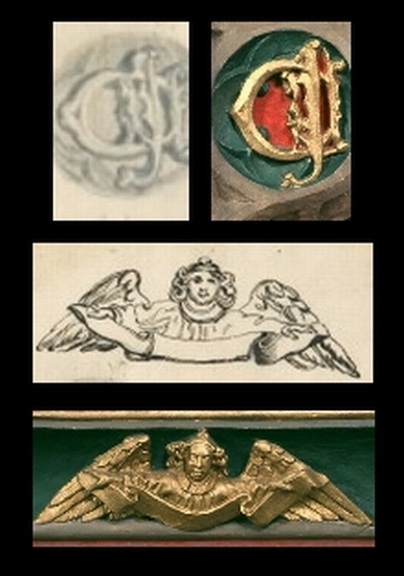 Oliver states that Precentor Milles "repainted it" and added some of the heraldry between 1747 and 1762. 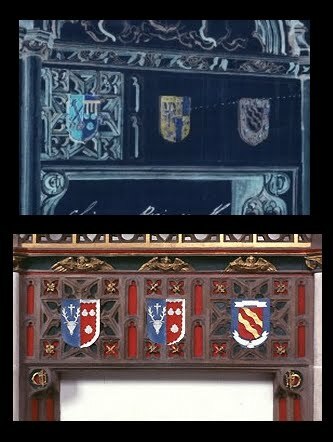 Was pre-existing heraldry over-painted or were entirely new escutcheons added? The presence of the bishop's mitre sculpted above the coat of arms of Milles's archbishop father-in-law suggests that Milles made alterations to the fireplace which went beyond merely repainting some coats of arms. It's possible that the entire florid canopy, i.e. everything above the lintel, is a mid 18th century invention. But then the overall form of the canopy could just as easily date to the end of the 15th century. Did the Victorians suspect that the canopy only dated to the 18th century which is why it was removed c1865 and the fleur-de-lis and pinnacles substituted in its place? Why would the canopy be removed at all? What happened c1865 which prompted such extensive alterations? It's tempting to assume that only the ogee-headed canopy shown on the 1833 drawing was altered and the rest of the fireplace remained intact, but this would be untrue. 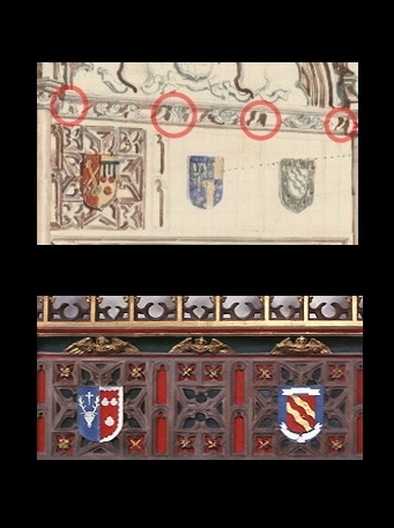 The image right shows the lintel as it appears on Hart's drawing and as it appears today in the museum. The locations of what I believe were four small armorial bearings described by Oliver are encircled in red on the 1833 drawing. There is certainly some sort of carved element there which is independent of the winged angels. Hart made an effort to indicate some shadow suggesting that whatever it was stood proud of the stone background. If these were four small shields then they were either added in plaster, perhaps by Precentor Milles, or they were carved in the late 15th century from the stone of the lintel itself. Today there is no sign that they ever existed. The stone between the winged angels on the lintel in the museum is completely smooth. Why would Precentor Milles bother adding four small plaster shields? But if the shields were carved in stone then their total disappearance is almost incomprehensible unless the lintel itself had been modified too. The central shield on the lintel, showing the Royal arms of Richard II, is also now missing. Was this another plaster addition which was subsequently removed? Did the medieval lintel really only have two shields at either side? Why would the medieval masons leave the central panel blank? From an aesthetic perspective, three shields would surely be preferable such as appear on the Courtenay fireplace (or five shields as once existed on the fireplace at the hall of the Vicars Choral). However I have been informed that this arrangement, with no shield, is an original feature, as was revealed when the fireplace was assembled for display at the museum in the early 1980s. The winged angels drawn by Hart are out of alignment with the panels on the lintel when compared with the fireplace in the museum, but Hart made a series of drawings of architectural interiors in Italy which he hoped to publish in the 1840s so clearly he was an accomplished draughtsman. Even more intriguingly, if the central shield as drawn by Hart was the exact same size as the two surviving shields then it doesn't seem possible that it would've fitted easily into the available space on the lintel as it exists today. Faint lines drawn around the central panel on the 1833 depiction suggest that prior to the alterations there was more room between the edge of the shield and the two little blind Gothic arches to the left and right. This can be seen on the image left. I've inverted the colours of the original drawing to make the faint lines and blind arches more visible. I've also added a central shield to the museum's fireplace and it's easy to see how the edge of the shield would be almost adjacent to the little cusped apertures. It's almost as though the lintel has shrunk. If Hart's drawing is remotely accurate and the central shield was indeed the same size as the remaining two then I believe that this is the most convincing piece of evidence in favour of the entire lintel having been radically remodelled in the 19th century. One possibility suggested to me is that the width of the fireplace could've been reduced in size to fit a smaller aperture, an action which necessitated the removal of the central panel with the Royal arms of Richard II and the splicing together of the remaining sections. The 1870 photograph of the fireplace shows that at least the lower part of the wall to the left of the fireplace was constructed from 18th or 19th century bricks while the wall to the right was made of large stone blocks, probably a remnant of the medieval great hall. I believe the fireplace was indeed dismantled c1865 and the lintel reduced in width. In order to accomplish this the central shield was removed and the remaining two halves spliced together, retaining only the edges of the central panel's lattice decoration. Presumably the component with the winged angels was also cut around to make the angels sit over the top of the reordered panels. It seems that the fireplace was not a Victorian copy as believed by the cathedral's surveyor in the early 1970s but neither is it a wholly medieval fireplace. I've cobbled together an impression of what was probably the medieval form of the fireplace prior to c1865 above left. All of the suspected Victorian changes have been reversed (although the 1960s paintwork remains). The lintel has been restored to what I believe were its medieval dimensions, complete with the four little bearings between each of the winged angels and the wider central panel carrying a central shield. The Victorian pinnacles and fleur-de-lis have been stripped away although the exact nature of the upper part of the medieval fireplace remains unknown. Either it had the ornate canopy shown in the 1833 drawing or, as is shown in the image, it just had a simple horizontal top as is found on similar examples in Exeter. 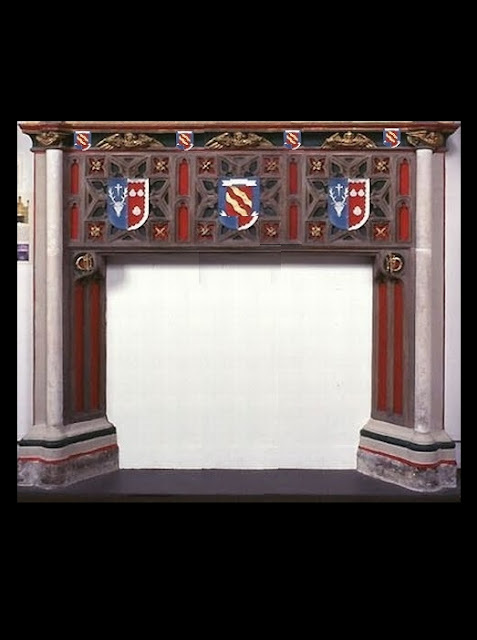 There's no question that the John Coombe fireplace came out of the Chantry in 1870 but between there are huge question marks surrounding the fireplace's medieval form and the numerous alterations which have obviously taken place between c1499 and 1870. The reasons for the alterations and much else relating to its history remain the subject of conjecture. The discovery of the drawing in the archives of the Royal Academy has perhaps solved one of the mysteries but there are numerous others, just some of which have been elaborated upon here. Unfortunately the John Coombe fireplace is no longer accessible to the general public. Following the recent refurbishment of the museum a lack of exhibition space has seen it relocated to the store room. Whatever its history might be, the fireplace remains an exceptionally fine piece of worksmanship. If it is not be displayed in the museum then perhaps it could be installed elsewhere in Exeter where it can be viewed and enjoyed by everyone. Detail of a winged angel below © Royal Albert Memorial Museum. Also known as the Ten Cells, Grendon's Almshouses stood in Preston Street from the beginning of the 15th century until they were demolished in 1879. 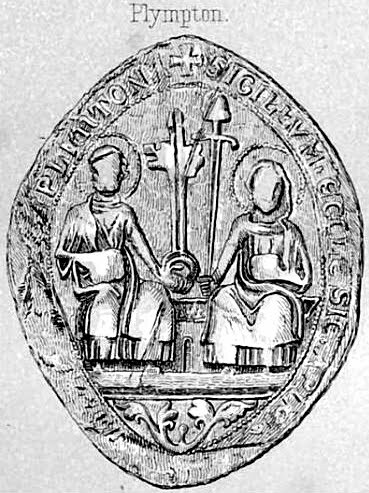 Simon Grendon was a thrice mayor of Exeter, in 1395, 1398 and 1405. In c1400 he endowed a complex of ten houses for use by the poor in the parish of St Mary Major. The site chosen for the almshouses was in Preston Street, one of the main routes through Exeter's West Quarter. Perhaps remembered chiefly today as a notorious 19th century slum, the West Quarter was the mercantile hub of the city throughout the Middle Ages and early post-Medieval period. Grendon gave his new almshouses the income from a field called Culverlands in the parish of St Sidwell. According to Izacke, Culverlands was located close to Scarlet's Cross, an ancient stone cross which formerly stood at the junction of Old Tiverton Road, Union Road and Mount Pleasant Road. The deed relating to the almshouses and the land is now lost but it was claimed to date to 1406. 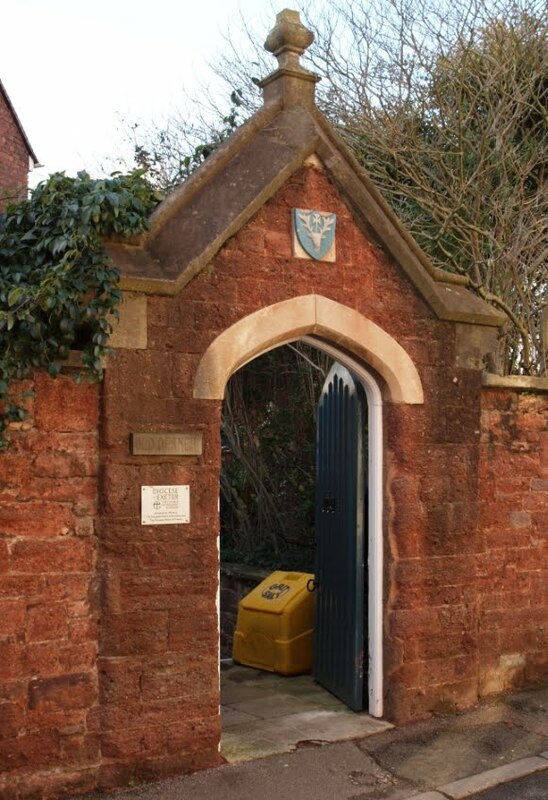 A number of other Exeter citizens endowed the almshouses in the subsequent centuries. 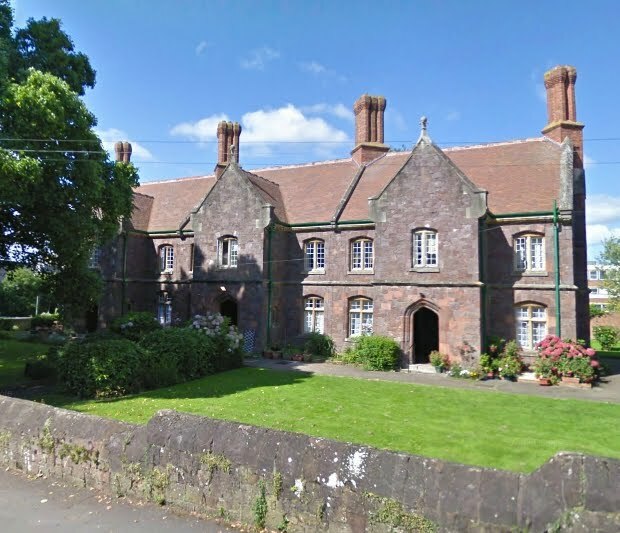 In 1556 Alice Heath endowed the almshouses with land in East and West Teignmouth; William Herne, the parson at St Petrock's, arranged for the 12 pensioners to receive a penny per week in 1562; and in 1563 William Bucknam, a former mayor, gave the almshouses part ownership of the Bear Inn nearby in South Street. These are just three examples of many. 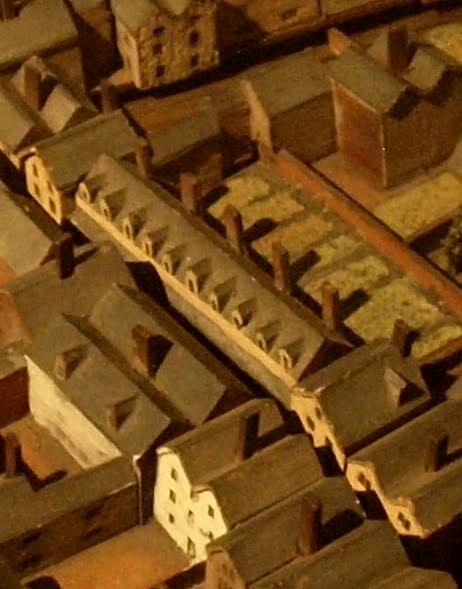 The almshouses appear on Benjamin Donn's 1765 map of Exeter as the "10 Cells". The ubiquitous Jenkins described the almshouses in 1806: "These houses are not built quadrangular, as most of our ancient buildings of this kind are, but in a direct line; each house having an upper and under room, with a small garden behind; they are kept in good repair, and in front they have a plain portico, or gallery, flagged with purbeck stone, which runs the whole length of the building, and makes a dry and comfortable communication of the aged inhabitants with each other". According to Richard Izacke, by 1674 the almshouses were "much decayed" and this was the year when Robert Lant gave £100 towards their rebuilding. Whether they were totally rebuilt or merely refurbished is unknown. It seems more likely that the walls were retained but roofs and windows replaced. The covered walkway which ran across the entire length of the ground floor elevation probably dated to the late-17th century works. Fortunately a few depictions of the building survive. One is shown at the top of this post. It's a detail from Hedgeland's early 19th century model of Exeter. Hedgeland's modelling of the almshouses is accurate and includes the little dormer windows in the roof, the pentice roof over the covered walkway and the small gardens stretching out behind each house. 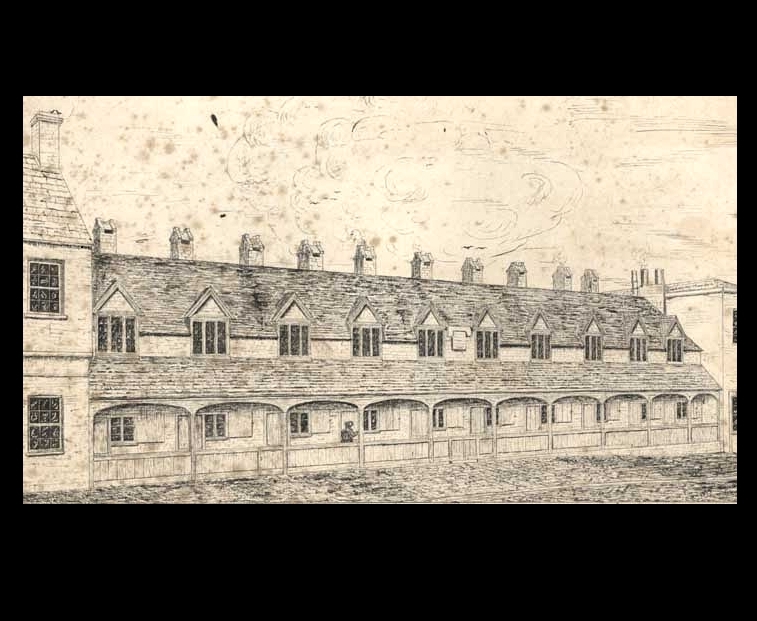 A pencil sketch above right © Devon County Council also shows the almshouses and gives a clearer view of the covered walkway. A similar walkway can still be seen on the very fine granite-built almshouses at Moretonhampstead in Devon. The almshouses only appear rarely in the 19th century editions of the local newspaper, the 'Exeter Flying Post', but in March 1856 it was reported that "a deformed man, named Corsey, was charged with stealing a quantity of lead from the roof of one of the ten cells at Preston-Street". In the 1870s it was decided to demolish the almshouses completely and relocate the residents to new buildings far beyond the city walls at Grendon Road which runs between Heavitree Road and Polsloe Road. The ancient buildings came down in 1879 and in November the following year it was reported that "the site of the old Ten Cells Almshouses sold for £390, the late occupants (females) occupying the new ones built in Grendon Road, Heavitree". On the site of the almshouses and gardens were built two opposing terraces of six houses, shown on the aerial view above left highlighted in purple. 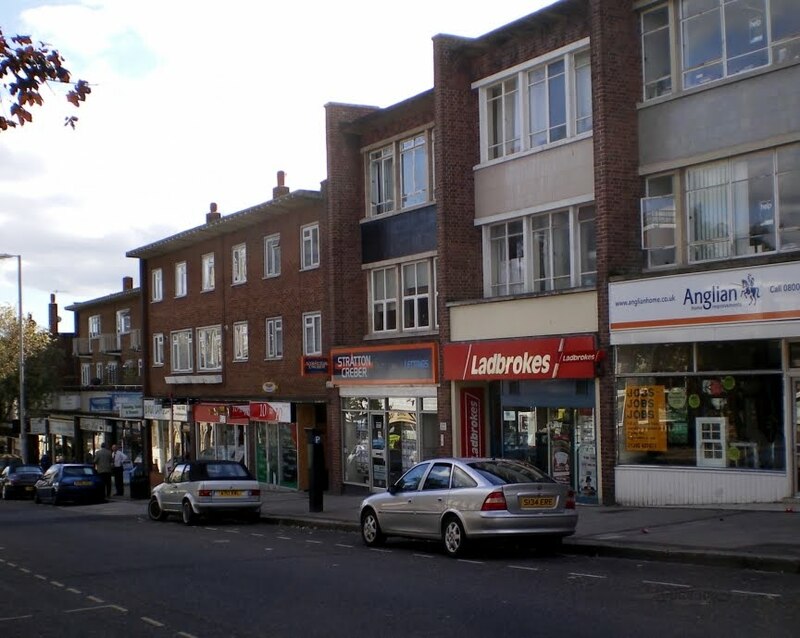 These are still known as Grendon Buildings. 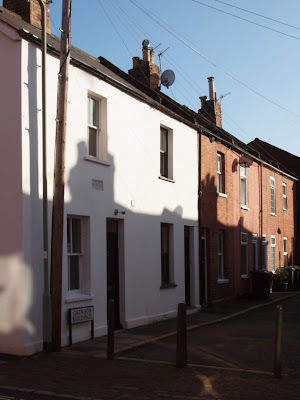 Dating to 1880, it is worth remembering that these twelve unremarkable small houses right are amongst the oldest standing structures in Exeter's entire West Quarter. 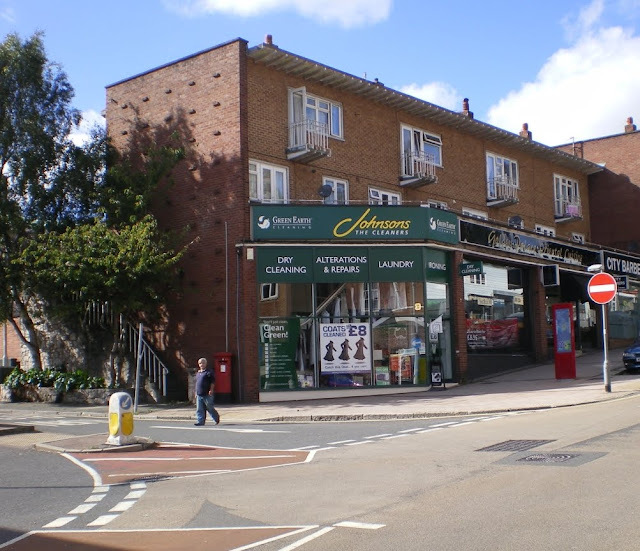 Exeter's post-war town planner, Thomas Sharp, regarded them as 'outworn' and recommended their removal. The area suffered limited damage during the Exeter Blitz of 1942 but was systematically cleared of nearly all of its historically interesting properties through deliberate demolition in the immediate pre-war and post-war period. The last surviving 16th century building in Preston Street (a Grade II listed building at No. 15) was demolished in the 1970s. The new almshouses on Grendon Road below were designed by Robert Best and built by Sharland. They are now Grade II listed buildings. Constructed from purple volcanic trap, Best's almshouses are extremely attractive examples of Victorian Tudor Revival architecture and are still known as Grendon's Almshouses. Adjacent to the Grendon Almshouses on Grendon Road are the Atwill Almshouses. The style is almost identical although the Atwill Almshouses were built from red Heavitree breccia and weren't completed until 1892. Nothing remains of the original almshouses on Preston Street. As far as I know not a single photograph or illustration exists which shows Sun Street prior to the destruction of its buildings in 1942. The image left is a detail from Hedgeland's early 19th century model of Exeter. 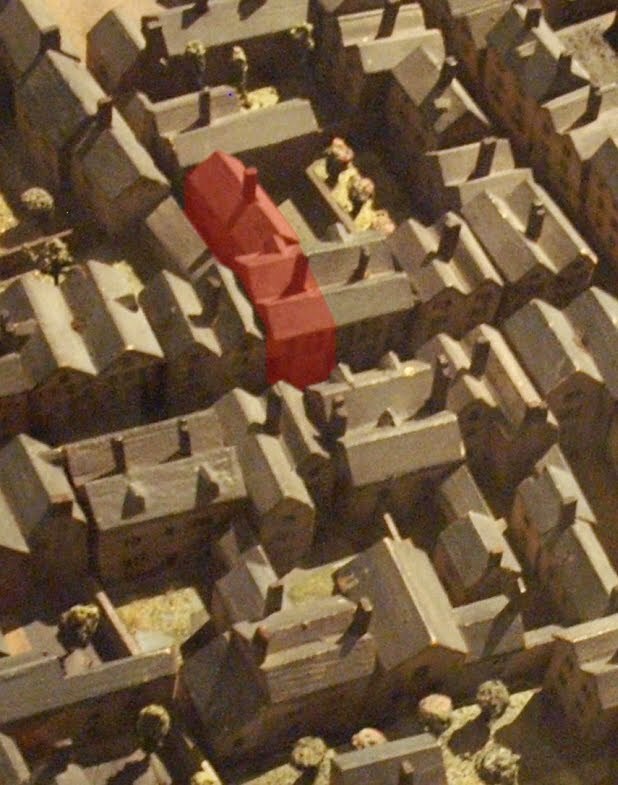 The accuracy of the individual houses is questionable but at least it gives some idea of the character of the street c1800. 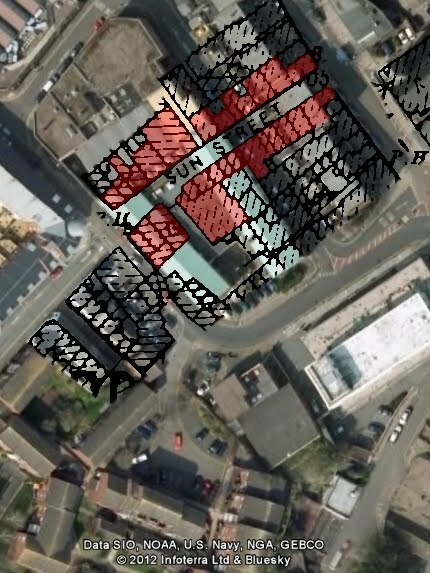 The properties which fronted onto Sun Street are highlighted in red. The continuation into Preston Street is at the top and the exit into South Street is at the bottom. In reality Sun Street was little more than an extension of Preston Street. It exited into South Street at a point almost opposite Bear Street. Like Preston Street, Sun Street was probably late Anglo-Saxon in origin. The two streets formed a long route up into the city centre from West Street and the early industrial district beyond the city walls on Exe Island. At some point the upper 270ft (80m) of Preston Street became known as a named route in its own right and Sun Street was born. A deed of 1566 relating to Grendon's Almshouses refers to Sun Street as 'Bellewtere Gate' and Benjamin Donn's 1765 map of Exeter shows that Sun Street was formerly called Billiter Lane. Hoskins wrote that "the meaning of Billiter is uncertain but it may derive from billet, "a note" - hence "writers' lane", where the medieval scriveners congregated". I wonder if there wasn't another source for the unusual name. 'Belyetere' is a Middle English word for a bell founder. Excavations between 1977 and 1978 at Mermaid Yard, almost at the conjunction between Preston Street and Sun Street, uncovered a waste dump including fragmentary clay-loam moulds in which bells were cast in the late medieval period. No structural evidence was found but it's possible that it was the site of Robert Norton's bell foundry. Norton was made a freeman of the city of Exeter in 1423 and he was still manufacturing bells in the 1440s. One of them hangs in the bell turret at the little church of St Pancras in the Guildhall Shopping Centre. By the 1830s 'Billiter Lane' had largely given way to 'Sun Street'. On the north side of Sun Street stood the Sun Inn, from which the street derived its new name. 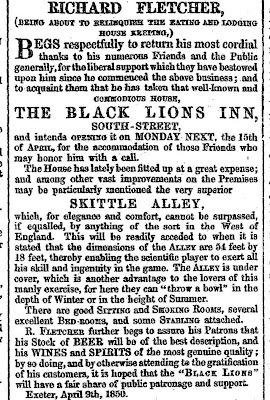 According to Hoskins the Sun Inn had been in existence since the 1690s although an advertisement from 1855 claimed that there had only been a successful business on the site since c1810. The inn had a bar, bar parlour, tap room, kitchen, club room, drawing room, five bedrooms and a large cellar. A very narrow passageway led down the side of the inn into Guinea Street. 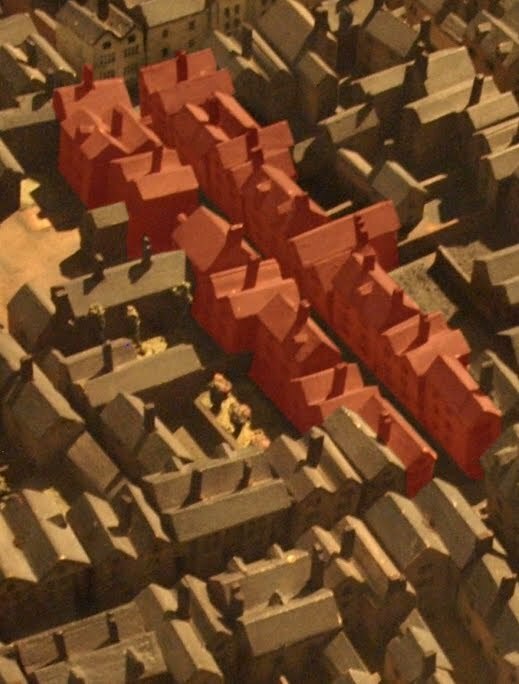 The image right shows a detail from 1905 map of Exeter overlaid onto a modern aerial view of the same area. The Sun Inn was the largest plot fronting onto the street, the passageway running north to Guinea Street clearly visible on the 1905 plan. The Sun Inn was the site of an early attempt to establish a trade union in Exeter. 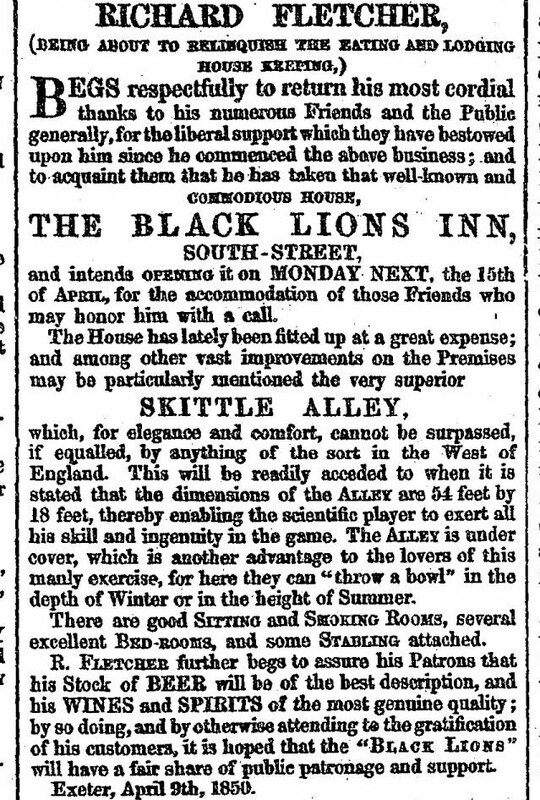 According to Hoskins again, on 15 January 1834 two men from London planned to hold a secret meeting at the Sun Inn. Around sixty Exeter workers, mostly bricklayers and masons, assembled at the inn where they were spied upon by a policeman who had bored a hole through a partition wall. Once the ceremony initiating new members had begun, the policeman ran to the Guildhall and alerted the rest of the police force. They descended en masse to the Sun Inn and, after much shoving against bolted doors, eventually arrested forty men. They were taken to the Guildhall where the mayor and an alderman were waiting for them. Eventually all but 15 were released and the rest were bound over and set free, a noticeable difference in comparison with the fate of the Tolpuddle Martyrs who, just seven years previously, had been deported to Australia for committing a similar 'crime'. The detail from a postcard c1900 left is the closest I've seen to anything depicting Sun Street. It actually shows the view looking down South Street but the entrance into Sun Street can be glimpsed disappearing off to the right. It appears that the corner property was removed in the 19th century perhaps to widen the entrance into Sun Street. 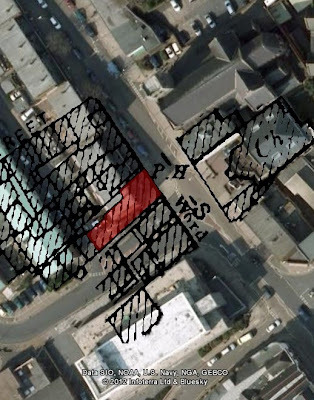 The 1876 Ordnance Survey map clearly reveals that at least one of the corner plot buildings had been demolished. In the postcard view this plot is occupied by a single-storey shop adjacent to its jettied timber-framed neighbour. With no surviving photographs, illustrations, archaeological reports or descriptions of its buildings, it is impossible to say what was lost when the entire street was destroyed during the bombing raid of 04 May 1942. The Sun Inn had ceased to be a public house by 1917 although the building itself survived until 1942, but absence of evidence shouldn't be taken as evidence of absence. The more one reads about pre-war Exeter the more apparent it becomes that vast amounts of the medieval and early post-medieval city survived into the 20th century, often buried beneath later alterations. 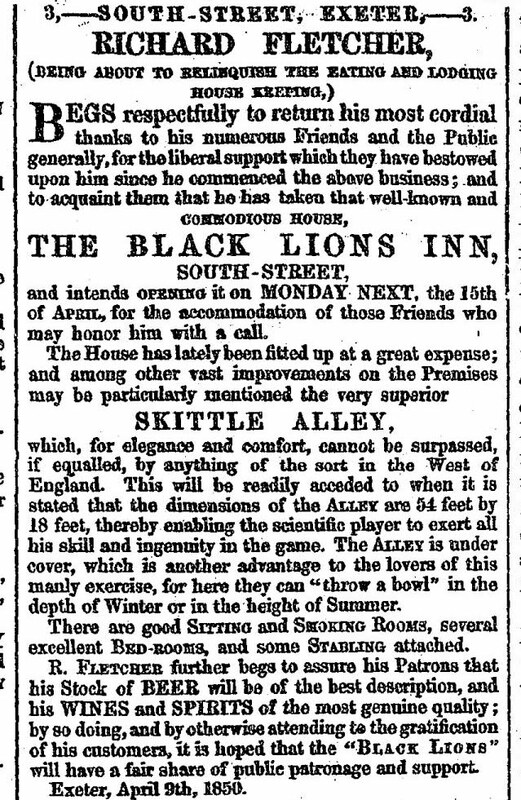 The Black Lions Inn on South Street, whose yard was formerly accessed via Sun Street, is one such example. A Georgian house from 1754 which stood behind houses on Sun Street is another. It was built upon medieval cellars and yet nothing is known about it as it too was destroyed in 1942 before it could be recorded. Like George Street, Milk Street and part of Guinea Street, the route of Sun Street was obliterated during the reconstruction of the area in the 1950s. There is now no indication above ground that the street ever existed. 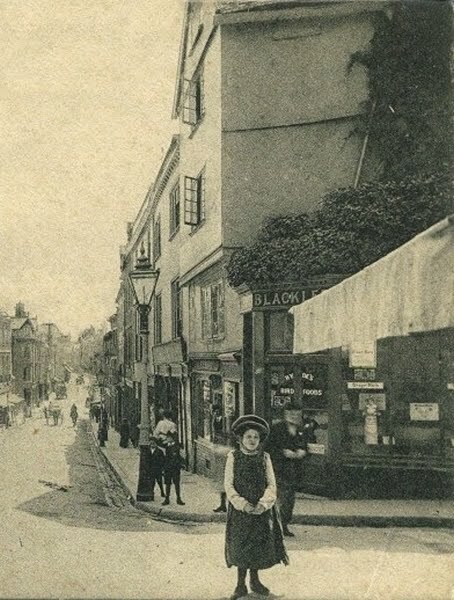 The photograph below shows South Street today. The entrance into Sun Street is somewhere beneath one of the shops to the far left. 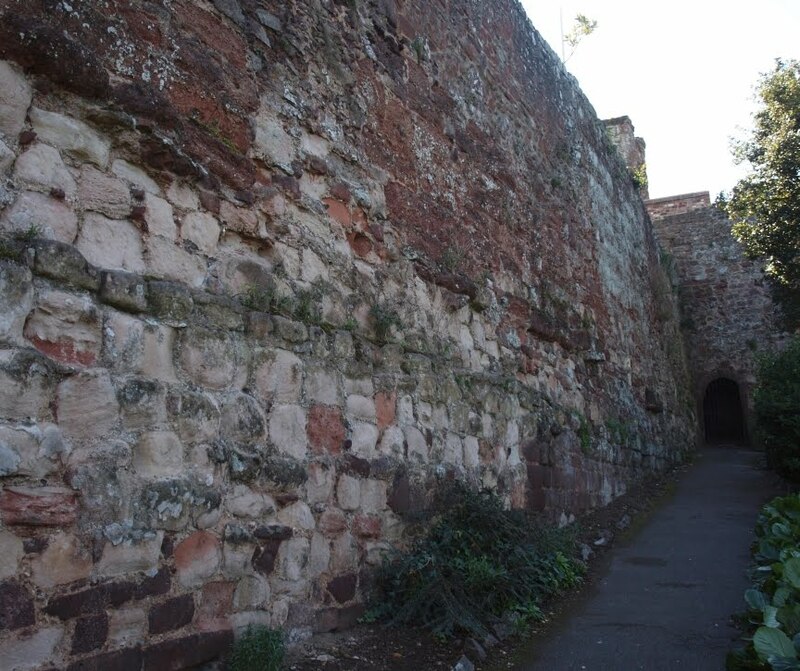 The public gardens at Northernhay are the site of one of the most important surviving sections of Exeter's ancient city wall left. What might at first glance appear to be little more than a random jumble of different stones actually tells a story which goes back to the 2nd century Roman town of Isca Dumnoniorum. The section of wall also contains one of the rarest of British archaeological survivals: evidence of stone Anglo-Saxon fortifications. 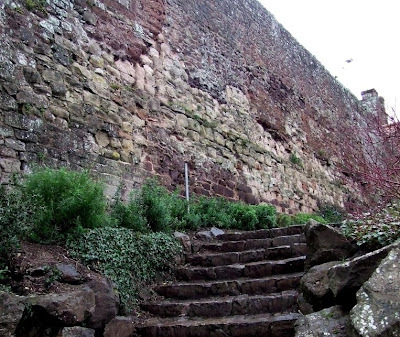 The section of wall is easily reached by walking under the early 12th century Athelstan's Tower, the eastern tower of Rougemont Castle, and into Northernhay Gardens. Walk down the slope and the section of wall is on the right. (One of the tower's turrets is just visible to the far right in the photograph above.) This is the exterior face of the wall, the side which would've confronted anyone attacking the city from the north. The ground level here has been much-altered since the public gardens, the oldest in England, were first laid out in 1612 and again in 1664 following the restoration of Charles II. 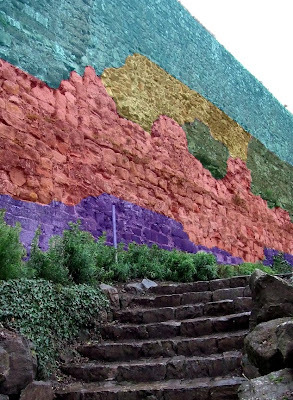 The photograph right has been colour coded to show the remarkable stratified layers contained within the wall. 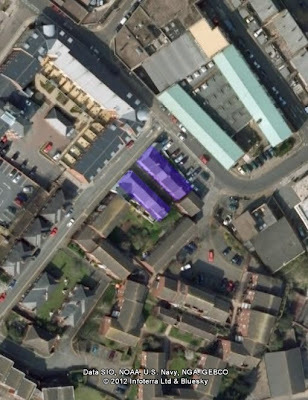 The area highlighted in purple is Roman masonry from c200AD, now partially buried by the later landscaping. The natural ground level is about 16ft (5m) below the level of the path. The extremely durable purple volcanic trap used by the Roman builders was probably quarried nearby in either Rougemont or in Northernhay itself. The section highlighted in yellow is Norman and dates to just after the Norman Conquest of 1066. It is probably associated with the initial construction of Rougemont Castle in c1068. The two areas highlighted in green show where the wall has been patched and repaired in the medieval period. 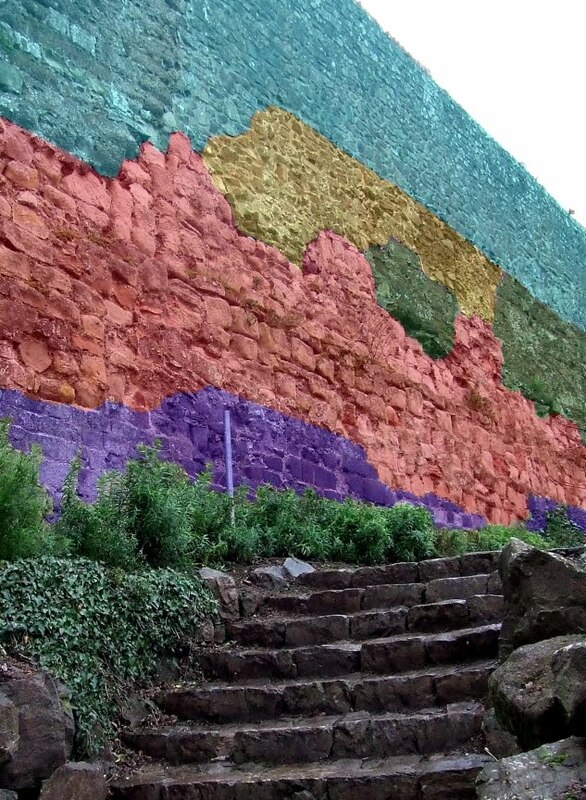 The repairs used the red Heavitree breccia quarried around Exeter from the mid 14th century onwards. The large section highlighted in blue is modern. The section highlighted in red are the Anglo-Saxon crenellated fortifications. Sandwiched between the early Norman masonry above and the Roman masonry below, they are constructed from white Triassic sandstone probably quarried from East Devon. This is believed to be the only stretch of Saxon town wall to be seen anywhere in England. Relatively little is known about Exeter following the retreat of the Roman Empire from Britain in the early 5th century to the arrival of the Normans in 1066. Even less is known about the city wall itself which the Saxons inherited from their Roman predecessors. There is a tradition that King Athelstan overhauled the wall circuit around c920. The fortifications could date from then or perhaps they were a defensive reaction after the town was laid waste by the Danish King Sweyn in 1003. It is just sheer luck that they have been frozen in time by later additions. The Great East Window left is one of the treasures of the cathedral. Compared with York Minster, Wells, Canterbury and many others, Exeter Cathedral isn't rich in pre-Reformation glass and few complete or nearly complete medieval windows survive anywhere in Devon. Two of the exceptions are the beautiful late 15th century panels in St Michael's at Doddiscombsleigh, some five miles from Exeter, and the Great East Window at Exeter Cathedral which contains the largest assemblage of medieval glass still surviving in any church in the county. 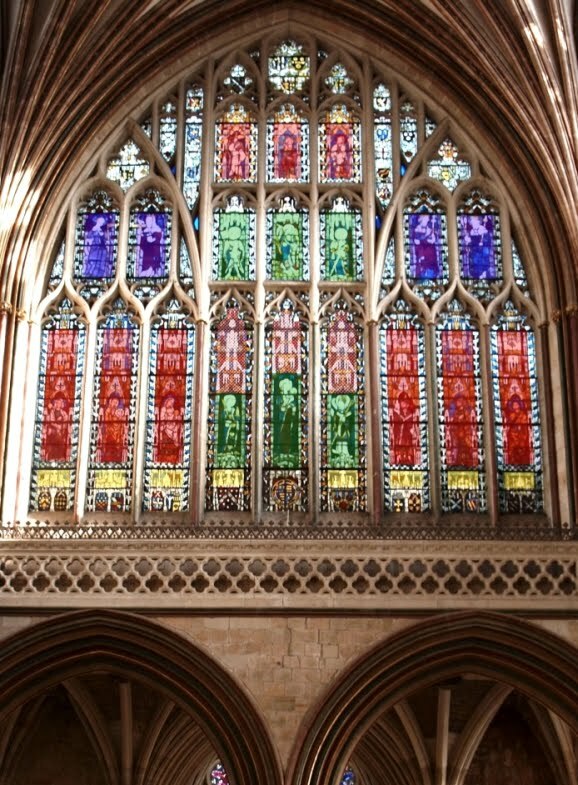 The history of the Great East Window is very complex as both the window and the stained glass have gone through numerous phases of development. The following account is little more than a summary. The cathedral archive is fortunate in possessing a very large number of fabric rolls. These rolls, actually written on vellum, are the medieval accounts which recorded work carried out on the cathedral's fabric. They are a major source of information relating to the Gothic rebuilding of the present cathedral between c1275 and the 1340s. 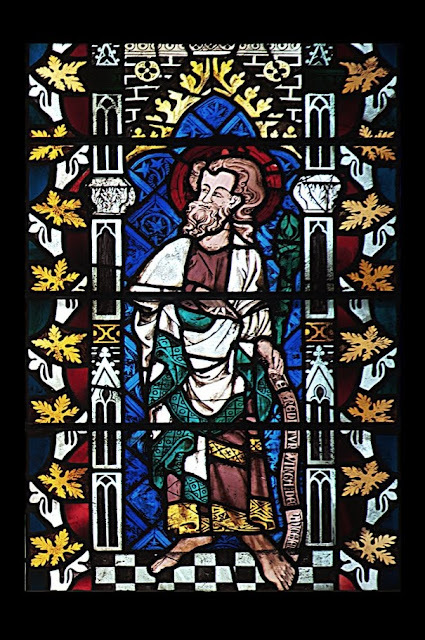 In 1304 an artisan called "Master Walter the Glazier" was paid £4 10s for "setting the glass of the high gable and 8 high windows and 6 windows in the aisles of the New Work". The "New Work" was the presbytery, including the choir and choir aisles. The "high windows" were in the clerestory and the ambulatory but the "high gable", the "summi gabuli", is believed to refer to the Great East Window itself. 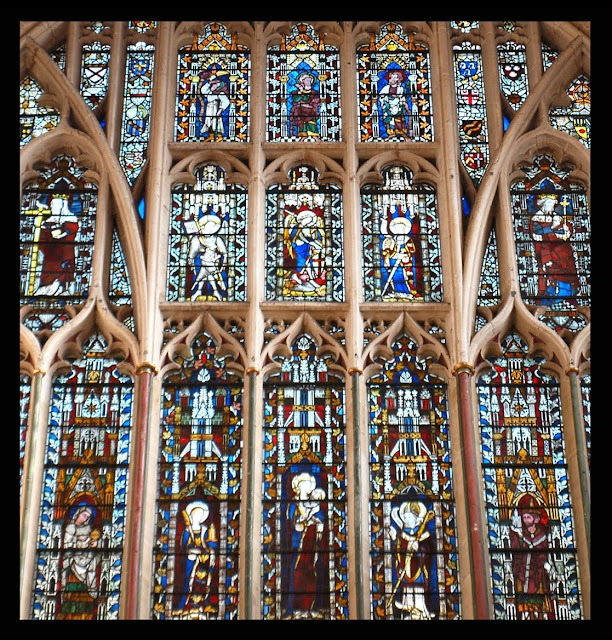 Extensive research outlined by Chris Brooks and David Evans in their 1989 book 'The Great East Window of Exeter Cathedral' has completely rewritten the window's history. Much of the information contained in this post is derived from the book. Prior to their work it was widely believed that the 1304 stained glass in the window was imported from the French city of Rouen by the cathedral authorities and that Master Walter merely fitted the panels himself. However Brooks and Evans have argued that Master Walter was not only part of a local workshop, or atelier, which designed, painted and fitted all of the stained glass in the presbytery, choir, choir aisles and the Great East Window itself, but that the buyers of the glass "were not the cathedral authorities but the independent atelier engaged in glazing the New Work". Four other panels associated with this workshop but by a different hand to the panels in the Great East Window still exist in one of the clerestory windows. The window which was glazed in 1304 was divided vertically into nine lights, much like the lower tier of the window today. Into each of these nine lights Master Walter set nine different figures. Other figures were installed in the upper openings of the window. Among the panels fitted by Master Walter were three apostles: St Peter, St Paul and St Andrew; three female saints: St Margaret, St Catherine and St Mary Magdalene; and three prophets: Moses, Abraham left and Isaiah. The figure of Isaiah in particular above right is regarded as one of the finest early 14th century examples of stained glass in the country. The nine figures in the lower tier were set within a tall decorative framework. The elaborate canopy of flying buttresses and pinnacles which rose above the heads of each figure was an important part of the overall design and a relatively common feature in glass from c1300. 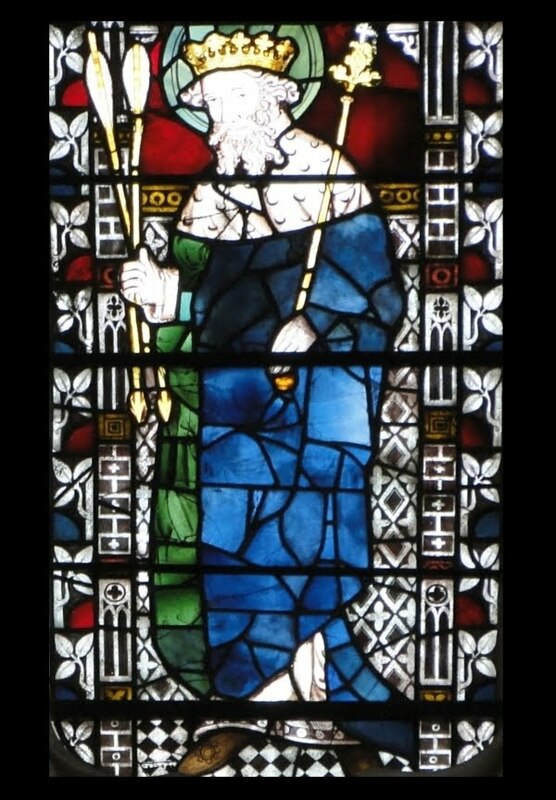 These panels are the earliest pieces of medieval glass in Britain for which it is possible to assign a known glazier. Even allowing for restoration, it seems remarkable that nine of the panels created and installed by Master Walter over seven hundred years ago should still exist in the building for which they were made, especially when so much of the surrounding medieval city has been destroyed, including the original masonry of the window itself! Master Walter was still working at the cathedral in 1311 when the fabric rolls record him fitting a window in the clerestory with the help of two young apprentices. 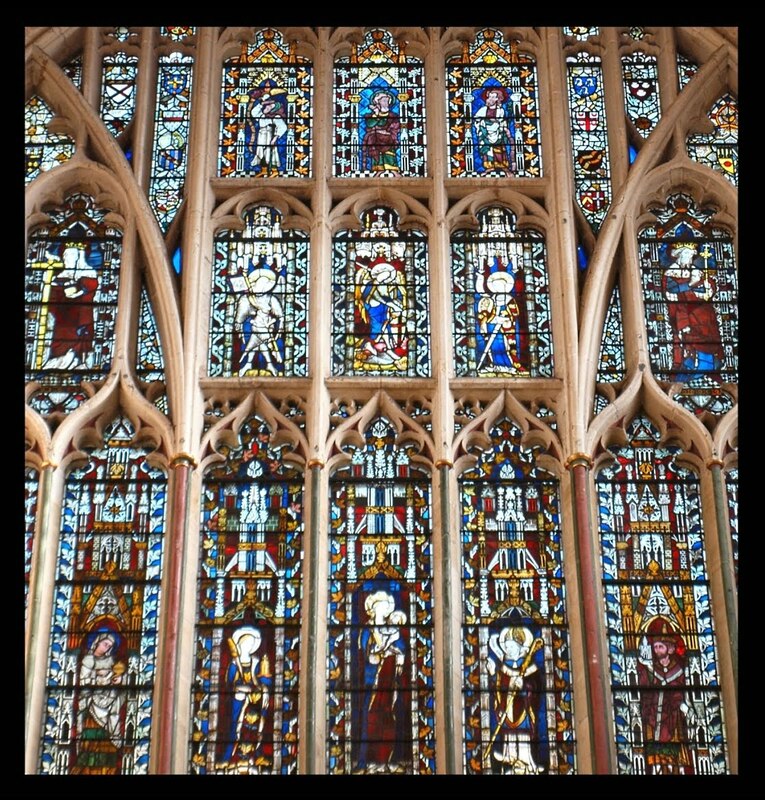 His glazing scheme in the Great East Window was to remain intact for less than 90 years. During the 1380s it was becoming obvious that the masonry of the window was badly deteriorating, probably the result of poor quality ironwork used in the original construction. Master Walter's glass was removed and the window was dismantled. Its replacement was designed in the Perpendicular style by the cathedral's master mason, Robert Lesyngham. According to the fabric rolls, Lesyngham drew the design on a skin of parchment which was purchased especially for 2d. Like its predecessor, the new window had nine main lights. It was also divided into three tiers with a row of panels containing figures in each tier. Four central mullions extended from the bottom of the sill to the top of the arch with transoms dividing the window into regimented sections. Such rigid linearity was the antithesis of almost every other window in the cathedral, most of which were designed in the Decorated Gothic style. A new window needed new glass. 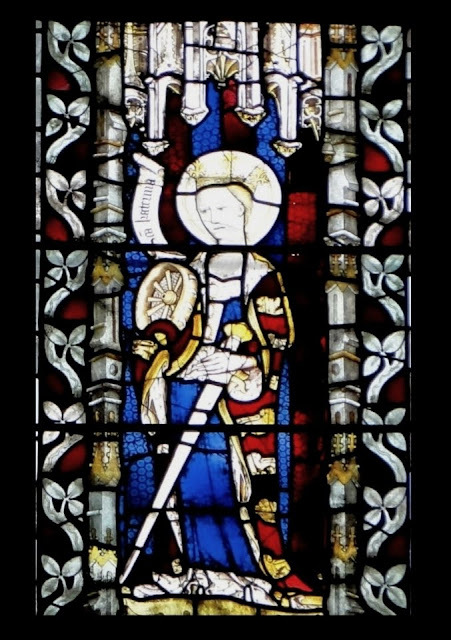 On 28 April 1391 an Exeter citizen called Robert Lyen was sworn in as the cathedral's glazier and a few weeks later he signed an agreement to glaze the rebuilt east window. But Robert Lyen wasn't just contracted to insert new glass. The agreement makes it clear that the Dean and Chapter wanted Master Walter's earlier glass of 1304 reinserted. For fitting the old glass panels Lyen was paid 3s 4d (40 pence) per week and his assistant was paid 2s (24 pence). Lyen was to receive 20d per foot for the new glass which was required to fill Lesyngham's newly-designed pattern of tracery. So what exactly was Lyen's contribution to the window in 1391? The first tier of nine large lights were refitted with Master Walter's panels featuring various figures beneath their tall canopies. Some of the early 14th century glass was also reused in the three smaller openings on the third tier at the top of the window. That left a second tier of seven openings into which Robert Lyen installed his own work. Of Lyen's seven panels only four, the two outer panels on each side of the second tier, now survive. Lyen's surviving panels all depict saints: St Sidwella (an 8th century local saint martyred outside the city walls), St Helen, St Edward the Confessor, and St Edmund the Martyr above right holding two arrows, the symbol of his martyrdom. It's interesting to compare Lyen's figures with those executed by Master Walter nearly a century earlier. Fashion and technology had changed dramatically. 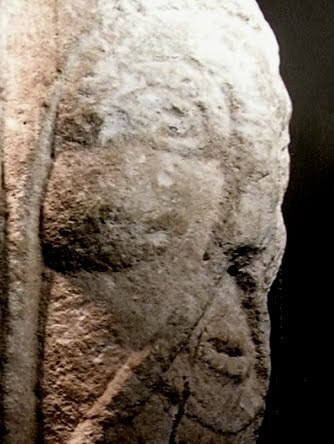 The faces are now three-dimensional, naturalistic and delicately detailed (the head of St Edward the Confessor above left is particularly accomplished) but the robes are less well-defined. Lyen also used yellow stain (silver oxide) and flashed glass in his panels, innovations which were unavailable to Master Walter at the beginning of the 14th century. The glass in the Great East Window survived as a combination of the 14th century work of both Master Walter and Robert Lyen until the Reformation in the 1530s. Regarded as idolatrous, three of Master Walter's panels in the centre of the lower tier were damaged. 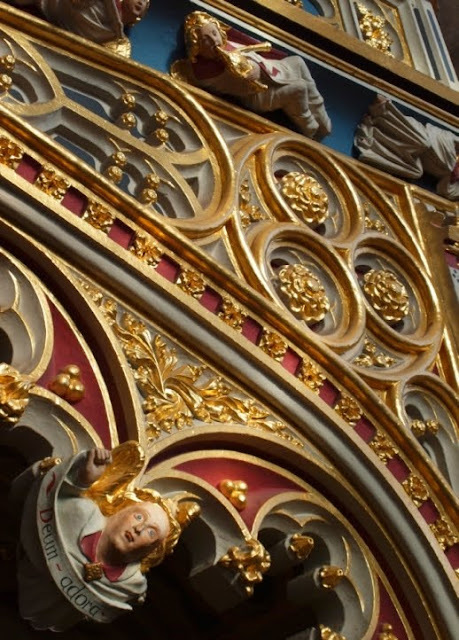 The figures were destroyed although the ornate canopies survived and were later restored. Three of Robert Lyen's panels in the centre of the second tier were also destroyed. More destruction occurred during the Commonwealth over a century later. The damage caused to these six panels resulted in the eventual introduction of six more panels of medieval glass. 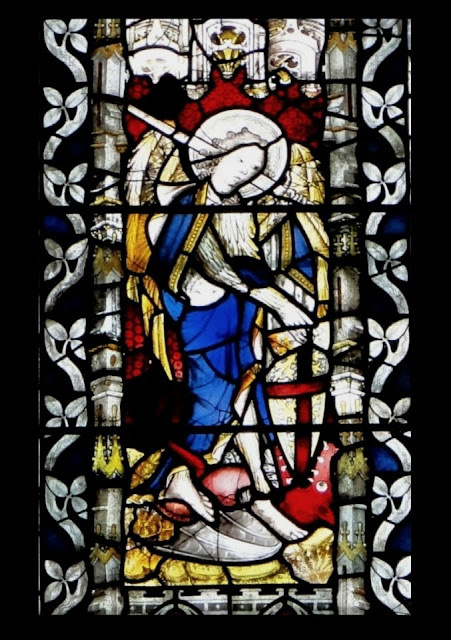 In 1750 the Dean and Chapter decided to restore the Great East Window and instructed the cathedral surveyor "to take such painted glass as can be spared from several imperfect Windows in the church in order to Compleat and Repair the East Window". The main focus of these repairs was to be the six panels which had been damaged during the Reformation. The six panels which were installed in 1751 were quarried from a partially damaged or "imperfect" window in the Chapter House. The Chapter House glass had been made between 1460 and 1470 in the same workshop as the above-mentioned windows at Doddiscombsleigh. Almost certainly based in Exeter, the 'Doddiscombsleigh workshop' has recently been recognised as a distinctive local school creating stained glass in the late Middle Ages. As well as at Exeter Cathedral and Doddiscombsleigh, examples of the workshop's output can still be seen at Ashton in Devon and at Winscombe, Pitcombe and Langport in Somerset. 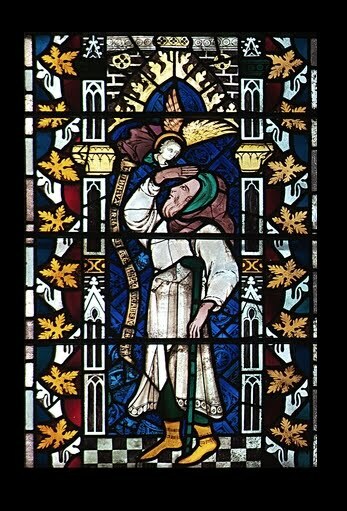 The Dean and Chapter possibly commissioned the window from the Doddiscombsleigh workshop as part of the rebuilding of the Chapter House following a serious fire earlier in the 15th century. One glazier seems to have been chiefly responsible for the window. 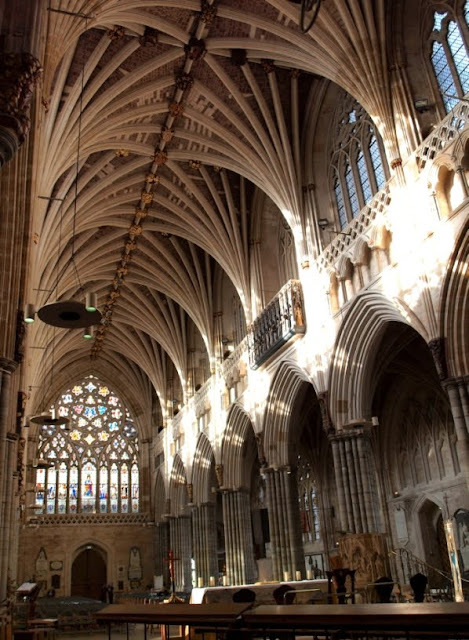 His identity is unknown but Brooks and Evans named him the 'Exeter Cathedral Master'. 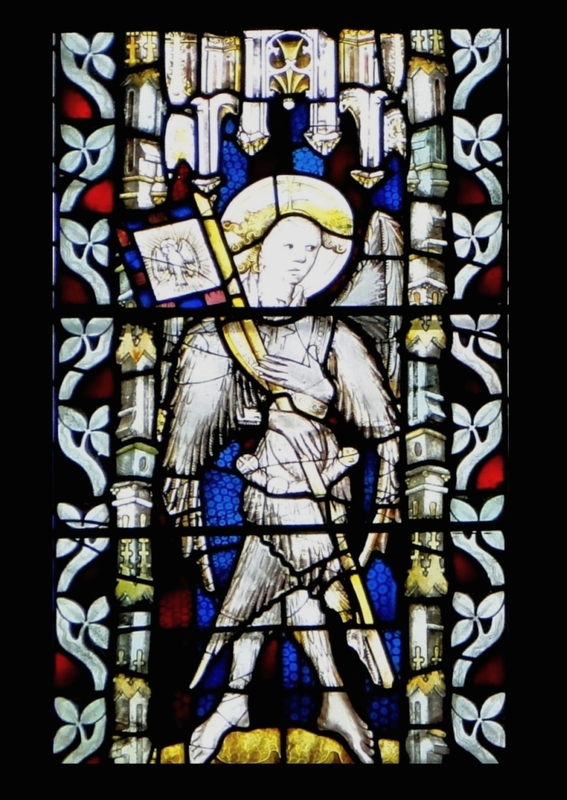 The surviving six main panels of what was once the Chapter House window depict an archangel wearing a suit of feathers and carrying a banner above right; the Archangel Michael wearing a blue robe over a suit of feathers and slaying a red dragon at his feet above left; and St Catherine holding a sword and the wheel associated with her martyrdom below right. 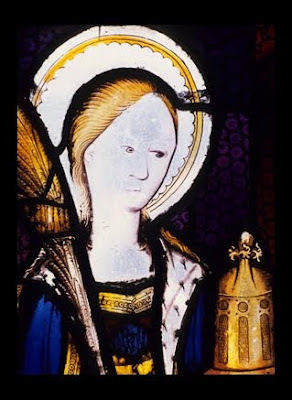 There is also a panel depicting St Barbara holding a feather in one hand and a small version of the tower in which she was imprisoned in the other, detail below left. The Virgin and Child is the tallest of the six panels. Mary is shown wearing a blue robe trimmed with ermine under which is a gold bodice. The final panel shows St Martin depicted as a bishop, wearing a mitre and holding a crozier in his left hand. Although restored and altered, I think these six panels of 15th century stained glass are some of the most beguilingly lovely and charming works of art in the entire cathedral. When most of the Chapter House window was dismembered in 1751 the figures of the archangel, St Michael and St Catherine were placed in the centre three openings of the second tier where three of Robert Lyen's 1391 panels had once been. The figures of St Barbara, the Virgin and Child and St Martin were placed in the three openings of the lower tier where three of Master Walter's 1304 panels had once been. Although now much restored, Master Walter's ornate canopies survive in the centre three lights of the lower tier. Bits of the same window, including a superbly drawn fragment of the Crucifixion and the head of an angel, are scattered throughout the cathedral. When first installed in the Chapter House, the panels seem to have formed part of a donor window. There were once at least four small accompanying donor panels showing the kneeling figure of a canon. Two of these exist along with a third which is a composite of two others. Another large panel, very similar in appearance to the one depicting the archangel in the suit of feathers, and by the same hand, came onto the market in 1999 and was purchased by the Royal Albert Memorial Museum. The donor canon panels are now together in the Chapel of St John the Evangelist. The Crucifixion and angel's head are in the Chapel of St Gabriel. The history of the Great East Window from the mid-18th century onwards is largely one of restoration and reorganisation. The glass underwent a major restoration by Frederick Drake between 1884 and 1896. He removed the decorative glass added in the 18th century and much of the heraldry was either restored, moved or replaced. Drake replaced some of Robert Lyen's canopies and bases which had survived since the end of the 14th century. Many of the leaf motif borders surrounding the figures were added, and the dragon, shield and parts of the wings of the 15th century St Michael were restored. All of the faces of Master Walter's 1304 figures on the lower tier were also replaced and replaced yet again in a further restoration between 1985 and 1986. In fact the list of post-18th century alterations is enormous. Brooks and Evans' book goes into great detail about the later history of the window for anyone interested. At the outbreak of World War Two the glass was removed from the window and stored at Sydenham Manor. The cathedral received a direct hit from a high-explosive bomb in 1942 and, if it had still been in the building, the glass would've been destroyed. It was reinstalled in 1948 and cleaned, repaired and releaded between 1982 and 1986. The image right shows a colour-coded photograph of the Great East Window based on a similar diagram in Pevsner and Cherry's architectural guide to the county. Master Walter's nine surviving figures from 1304, six with tall canopies, are highlighted in red. 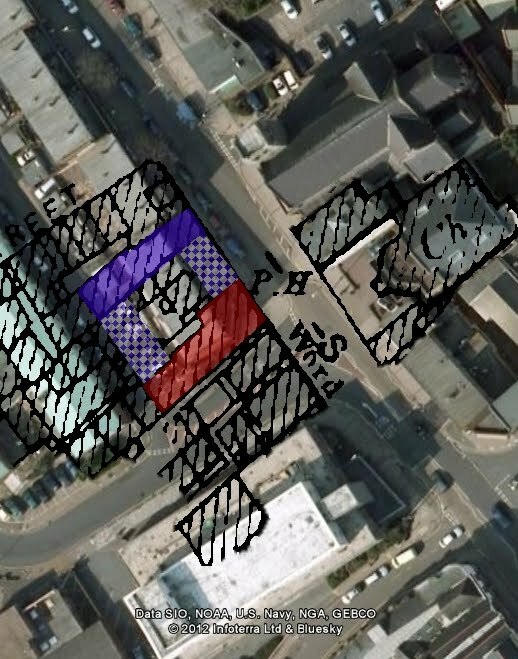 His three much-restored canopies in the centre of the lower tier are also highlighted in red. Robert Lyen's four surviving panels from 1391 are highlighted in purple. The six 'Doddiscombsleigh workshop' panels of c1470, which were formerly in the Chapter House, are highlighted in green. Other decorative elements of the former Chapter House window are highlighted in yellow and act as the bases to eight of the lower tier panels. All of the figures have undergone some restoration or alteration but they have all retain their medieval integrity to some extent. The original iconography has also been lost (for example, there are now two depictions of St Catherine in the same window) but the Great East Window remains an important collection of pre-Reformaton stained glass. Exeter Cathedral is not only the city's finest building. It is also the most celebrated example of Decorated Gothic architecture in England and one of the most lovely medieval structures in Europe. The interior, in particular, is of remarkable beauty and successfully pulls off the difficult trick of being both intimate and spectacular. In many ways the cathedral is Exeter. It is impossible to imagine the city without it. As a former chancellor once said: "Nowhere is there a cathedral of greater originality, of more complete harmony, of more obvious and striking unity". Although it is probably overshadowed in the popular imagination by other English cathedrals which are significantly larger or older or taller or more immediately impressive, in its own way Exeter Cathedral is incomparable. It is filled with wonderful things. The 300ft unbroken stretch of tierceron rib vaulting has been called "the longest and probably finest Gothic vista in the world". The cathedral has the oldest existing set of misericords in the country, an image screen of 14th century sculpture which is amongst the most complete in England and a vast early-14th century bishop's throne described as "the most exquisite piece of woodwork of its date in England and perhaps in Europe". It has the 'Exon Domesday' of 1068 and the 'Exeter Book', donated by the cathedral's first bishop and which is the largest single collection of Anglo-Saxon literature in existence. Until the construction of Liverpool's Anglican cathedral in the 20th century, the south tower had the heaviest peal of bells in the world. There is a late-15th century astronomical clock, a great east window of 14th and 15th century stained glass and two enormous Norman towers which stand above the transepts in an arrangement which is unique in any cathedral in Britain. Much of the beauty is in the detail, in the harmonious arrangement of pillars and arches, in the subtle use of coloured stone and in over 400 medieval bosses carved with breathtaking virtuosity depicting dogs and dragons, mermaids, pelicans, owls, lions, cats and calfs, rabbits, kings, queens, knights and bishops, and foliage and flowers of incredible botanical naturalism. And it is set within the Cathedral Close with its medieval canons houses which, together with the cathedral itself, comprise one of England's most charming and picturesque townscapes. Unlike many English cathedrals, the vast bulk of the building has remained essentially unchanged since it was completed in c1342. There have been no collapses of towers, or damaging fires, or reconstructions of west fronts by over-enthusiastic restorers, although the Nazis tried and failed to obliterate it in 1942. Although it is a complex building, the history of its construction is relatively straightforward. The site of the Cathedral Precinct has been occupied for nearly 2000 years. In c50AD it was part of a 42 acre fortress built by the Second Augustan Legion. The extensive remains of the bath house built and used by the Roman soldiers still lies under the steps leading to the cathedral's west front. (The bath house was one of the largest and most elaborate ever to be built in early Roman Britain). By c200AD the site of the bath house had been incorporated into a basilica. There would've been a shrine here dedicated to a pagan deity. At the end of the 5th century the basilica complex was being used for pre-Saxon Christian burials. It's possible that the basilica itself had been converted into a centre for Christian worship prior to the withdrawal of the Empire from the British Isles in the early 400s. A monastery had been founded on a site just west of the present cathedral before c690AD, in the same location as the pre-existing 5th century cemetery and old Roman basilica. It was probably at Abbot Wulfhard's monastery that St Boniface, the patron saint of Germany, began his education at the end of the 7th century. 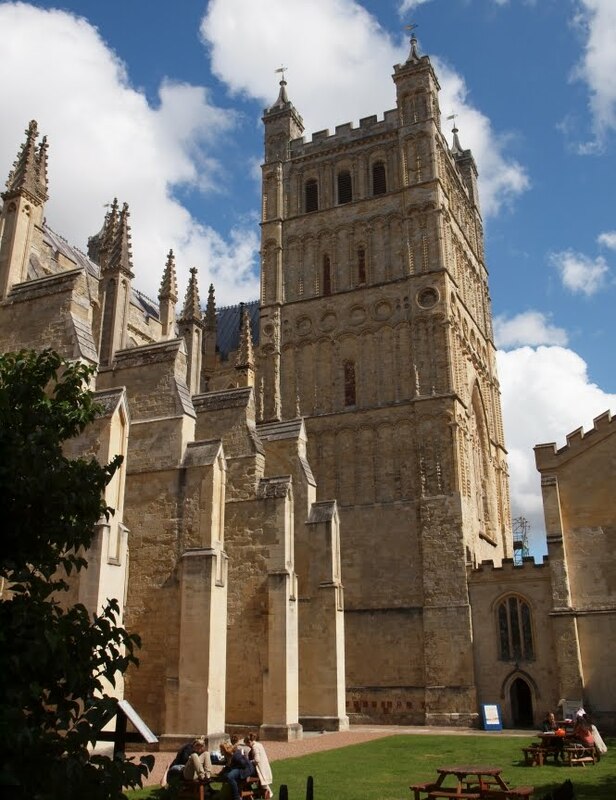 It seems that the monastery was refounded as a Benedictine establishment dedicated to St Peter and St Mary by the Anglo-Saxon King Athelstan in c932, by which time Exeter was about the sixth most prosperous settlement in Britain. The monastery was rebuilt by Cnut in 1018 after the Anglo-Saxon town was devastated by the Danish king, Sweyn Forkbeard, in 1003 possibly as revenge for the death of his sister during the St Brice's Day Massacre. The raid also probably destroyed numerous documents relating to the earlier monastery making it difficult to be precise about various dates and facts. 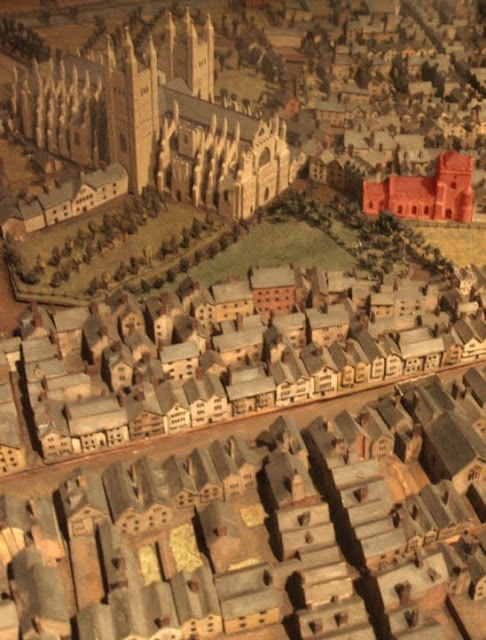 The detail from Hedgeland's model of Exeter above right shows part of the Cathedral Precinct as it appeared towards the end of the 18th century. 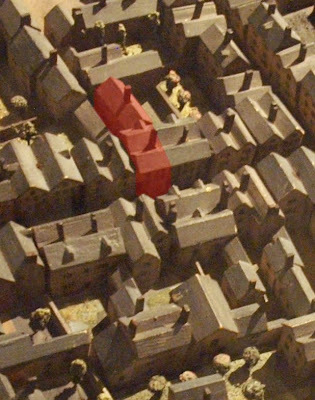 The church of St Mary Major, highlighted in red, was on the site of the late Saxon minster which became Exeter's first cathedral. Although the church had been altered in the late Middle Ages, it's highly likely that some fabric from the minster remained within the church walls until it was demolished in 1865. In 1050 the Bishop of Crediton, Leofric, received papal approval to move the See from Crediton to the more secure town of Exeter, still surrounded as it was by much of its 800-year-old Roman defensive wall. The Diocese of Crediton had been created in 909 to cover the two counties of Devon and Cornwall. 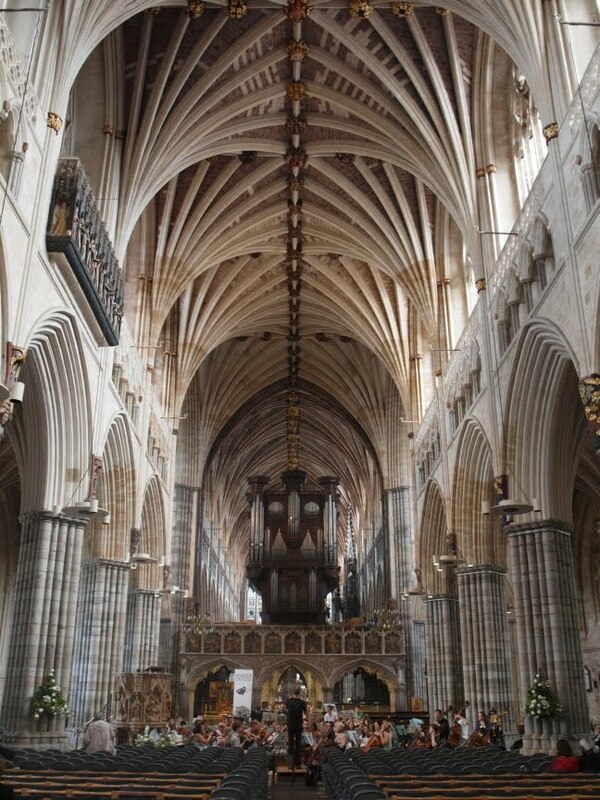 With the relocation of Leofric's throne (or 'cathedra') Exeter became a cathedral city. Leofric didn't even need to build a new church as the active Benedictine monastery at Exeter already had a fully-functioning minster. This minster, approximately 75ft west of the present cathedral, was Exeter's first cathedral and it was here, probably on St Peter's Day in 1050, that Leofric was enthroned as the first Bishop of Exeter in the presence of Edward the Confessor himself. The monks at the monastery became the first canons of the new cathedral. The image above left is a drawing of the first seal which was used by the Cathedral Chapter. Its earliest surviving appearance is on a document from 1133. 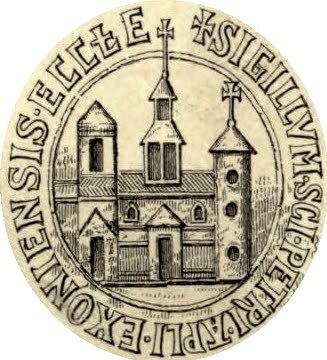 The seal probably depicts the Saxon cathedral where Leofric was enthroned in 1050. Unfortunately it's not possible to gauge the architectural accuracy of the illustration. It is known that Leofric's minster had a very simple layout with no aisles but with an eastern apse, a chapel or porch and probably a crypt where Leofric was interred in 1072. It certainly had a bell tower as well. When Leofric arrived in 1050 he found seven bells already installed. It was also probably built largely from materials reclaimed from the ruined public buildings of the Roman city. The continuity of occupation and the sheer depth of the history spanning almost exactly an entire millennium is extraordinary: Roman military bath house and civilian basilica to early-Christian cemetery, Saxon monastery to late Anglo-Saxon cathedral, and the Battle of Hastings is still 16 years in the future. 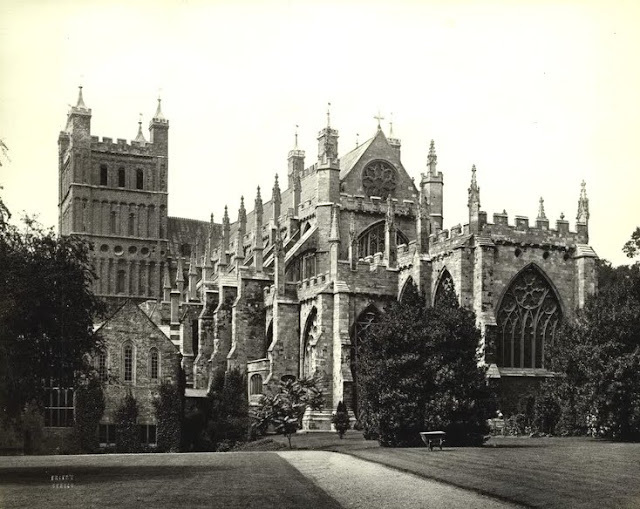 It's worth remembering that the old minster functioned as Exeter's first cathedral for 83 long years. 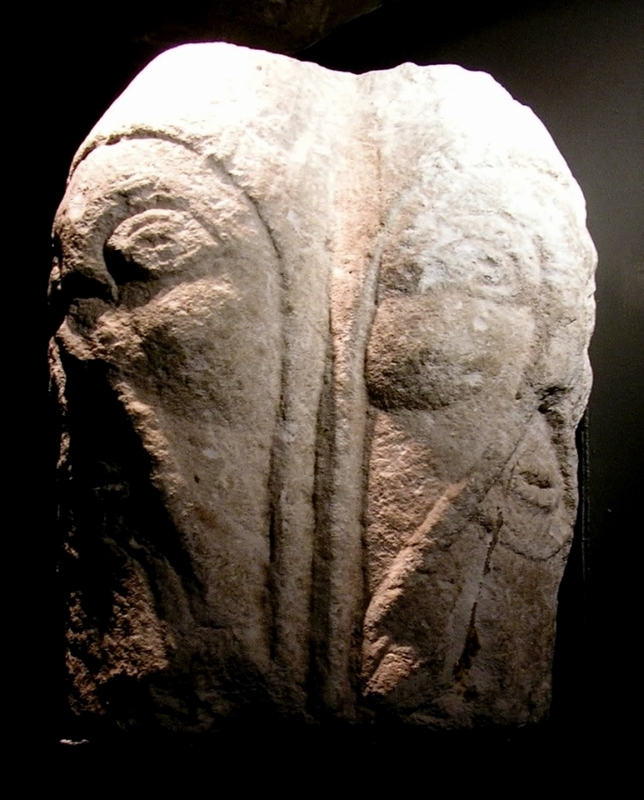 It was still being used, and Leofric was still the bishop, when William the Conqueror turned up outside the East Gate and laid siege to the city in 1068, and it was still being used in the 1110s when William Warelwast, the third Bishop of Exeter and allegedly the Conqueror's nephew, decided to replace the Saxon cathedral with a new Romanesque building. Work began in 1112 on a new site slightly to the east of the Saxon cathedral, although the minster continued to be used for cathedral services until 1133. The new cathedral was predominantly built from a pale sandstone quarried at Salcombe Regis in East Devon with an inner rubble core of purple volcanic trap quarried from sites around Exeter. Compared with its Saxon predecessor, the Romanesque cathedral was gigantic. It was the same width as the current cathedral and extended for approximately 270ft (82m) from the west front seen today as far as the second bay of the choir. The eastern end had a five-sided main apse. The first part to be completed was the eastern arm which was consecrated in 1133 although the minster church was retained and used as the parish church of St Mary Major for over 730 years. The two tremendous transept towers, both of which survive today, were built in stages between c1120 and c1170 above right. Each tower is over 140ft (44m) high and ornamented with dog-tooth decoration, blind arcading and (on the south tower left) blind occuli. Each tower is slightly different although both were originally capped with a squat, four-sided spire. It is not known why the Norman cathedral was given transeptal towers instead of a central crossing tower. Such an arrangement has few parallels anywhere in Europe, although the abbey church of Cluny III has been proposed as a model. It has also been speculated that the collapse of the central tower at Winchester Cathedral at the beginning of the 12th century might've dissuaded Warelwast from repeating the design at Exeter. 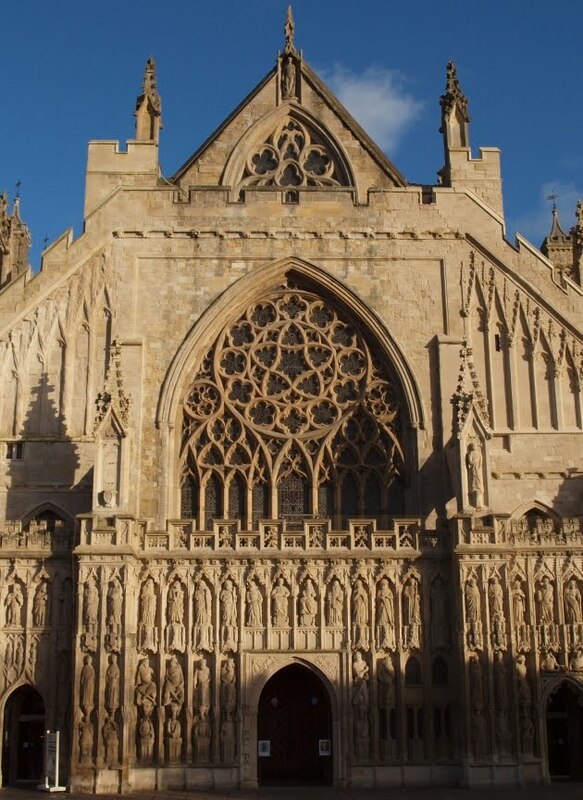 When completed in c1170, the Romanesque cathedral at Exeter would've been overwhelmingly larger than anything else ever built in the southwest peninsula of England up to that point, an expression of political and military power as much as it was a building for spiritual enlightenment. More like a castle than a cathedral, it is difficult to imagine the impression it must've made on Exeter's population. Work continued even after the main bulk of the building had been completed. The chapter house was added by Bishop Brewer in c1225, the misericords were carved between 1230 and 1270 and various tombs were installed, including one for Leofric whose remains were transferred from the former minster. The Norman cathedral was less than a century old when Exeter's bishop, Walter Bronescombe, attended the consecration of Salisbury's newly-built cathedral in 1258. The Early English Gothic architecture at Salisbury, with its lavish use of pointed arches and large window openings, is believed to have inspired Bronescombe to plan rebuilding the cathedral at Exeter. Between c1275 and c1342 the entire cathedral was rebuilt, except for the two 12th century transept towers. It is this version of the cathedral which can still be seen today. The architectural style was to be the newly-emerging Decorated Gothic, especially in its geometric form, a style characterised by an increasing elaboration of the vaulting and window tracery and by a proliferation of flowing and naturalistic carving. Preparations had probably begun by c1270 and construction work by c1275. The eastern arm of the Romanesque cathedral was demolished and much of the rubble was used to level the ground to the east. This created a level platform on which the Lady Chapel and ambulatory could be built, approximately 100ft beyond the end of the Romanesque building. The flanking chapels of St James and St Andrew were ready for glazing in 1279 although the Lady Chapel was only at window sill level in 1280 when Bishop Bronescombe died. The interior walls of the north and south towers were thrown down in 1286 and work on the choir went on throughout the 1280s and 1290s. The retention of the two Norman towers dictated the height of the vaulting to some extent, which remains low in comparison with many others. There are some stylistic differences in the earlier phases of the rebuilding but in c1290, during the construction of the choir, the second master mason involved in the overall design of the building discovered one of the architectural keys which would unlock the entire building: the Exeter pillar. This pillar left appears for the first time in the cathedral behind the High Altar, after the construction of the Lady Chapel and other eastern chapels. It consists of 16 shafts of Purbeck marble grouped together into a single column, possibly inspired by similar clustered shafts at Old St. Paul's in London. 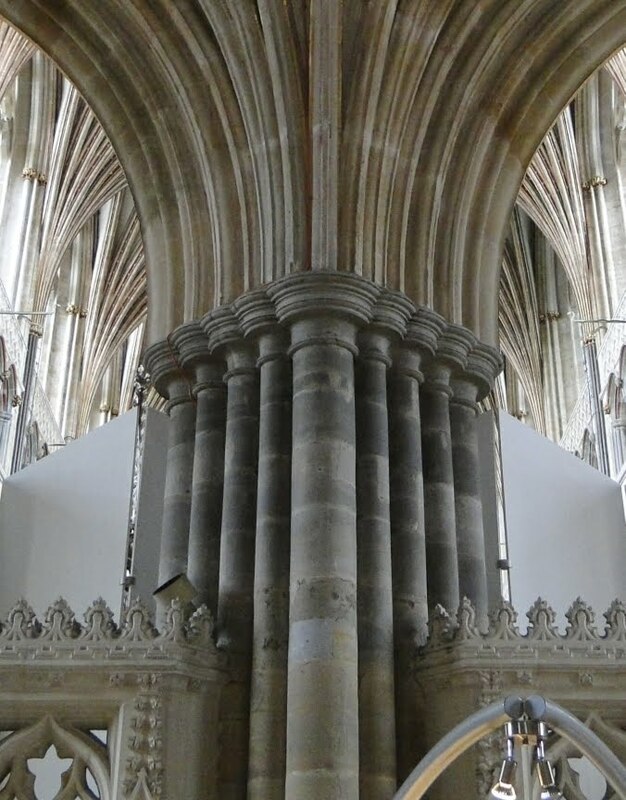 From this point onwards the Exeter pillar was used as the template for nearly all of the other supporting pillars in the cathedral. The pattern of the tierceron vaulting was established at the same time. Using more tiercerons than anywhere else, the master mason conceived of a vault which was more opulent than anything else in England at the time. This mason, known as the Exeter Master, didn't create a new style. He simply used a pre-existing style and took it beyond anything that anyone had attempted before. Construction continued westwards. A succession of different bishops were enthroned and at least six master masons, including the unknown Exeter Master responsible for most of the overall design, came and went, but the template remained the same. 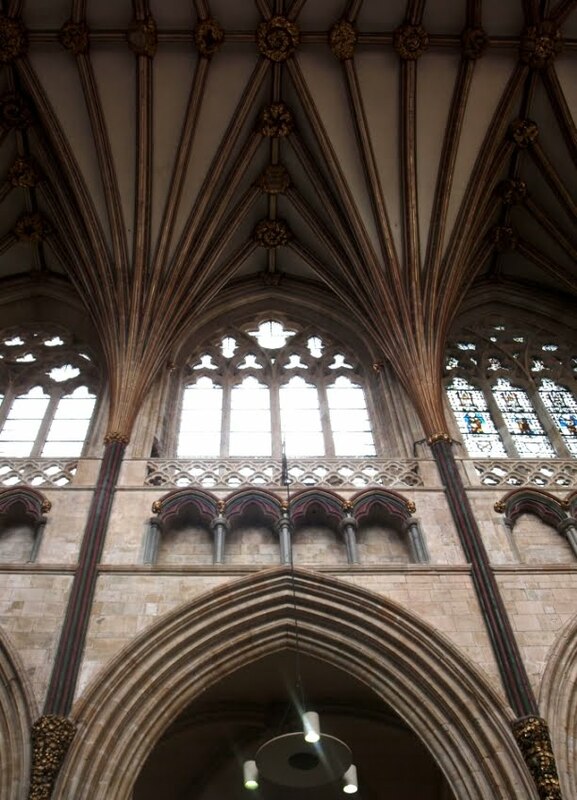 It is this general uniformity of style, and the inspired quality of its execution, which makes Exeter Cathedral the epitome of Decorated Gothic architecture. The entire eastern arm, including the choir right, was structurally complete by c1310 and the High Altar was dedicated in 1328. The nave was then demolished down to the current level of the window sills and the western arm rebuilt in the same style as the rest of the cathedral below left. Despite the decades which had passed since the design was initiated, the master masons who supervised the rebuilding generally respected the stylistic direction of their predecessor's work. The only major exception would be the installation by Thomas of Witney of the triforium in the already completed presbytery c1315. As Pevsner and Cherry state, "evolution can only be seen in the details", particularly in the carving of the ceiling bosses as the work progressed from east to west. It's difficult to comprehend the number of people who must've laboured their lives away on the cathedral, or the busy hands that spent years carving stone and wood, or the sheer physical effort involved in hauling the building out of the ground, but as a unified architectural vision Exeter Cathedral is stupendous, a testament to the imagination and determination of its medieval creators. Like most other cathedrals in England, Exeter Cathedral has experienced its share of vicissitudes since it was completed. The altars were dismantled during the Reformation. Bishop Stapledon's silver retable and colossal stone reredos, bristling with up to forty-eight statues, were destroyed. Worse occurred during the Commonwealth when the cloisters were demolished in 1657 and the space used as a cloth market. Much of the stained glass was also destroyed and some of the iconography was defaced, although fortunately the 14th century image screen mostly survived intact. The medieval choir stalls were also demolished in order to accommodate pews for the Presbyterians (part of the choir stalls were installed in St Lawrence's church before they were destroyed in 1942.) The medieval cathedral was saturated with colour and much of this has been lost in the subsequent centuries. A major restoration was carried out under George Gilbert Scott between 1870 and 1877 but this was relatively sympathetic e.g. Scott refused to destroy the pulpitum of 1324 as some of his critics had demanded. Scott replaced the post-Restoration choir stalls but reused the 13th century misericords which had been carved for the Romanesque cathedral. In 1939 the Bishop's Throne was dismantled and, along with the medieval glass from the east window, the misericords and the superb effigy of Bishop Bronescombe, was removed from the cathedral for safe-keeping. It seems unlikely that Exeter would've been targeted during World War Two if it hadn't been for the cathedral. Its complete destruction was the ultimate aim of the devastating air-raid of 04 May 1942. The late 13th century St James's chapel was completely destroyed by a high-explosive bomb. 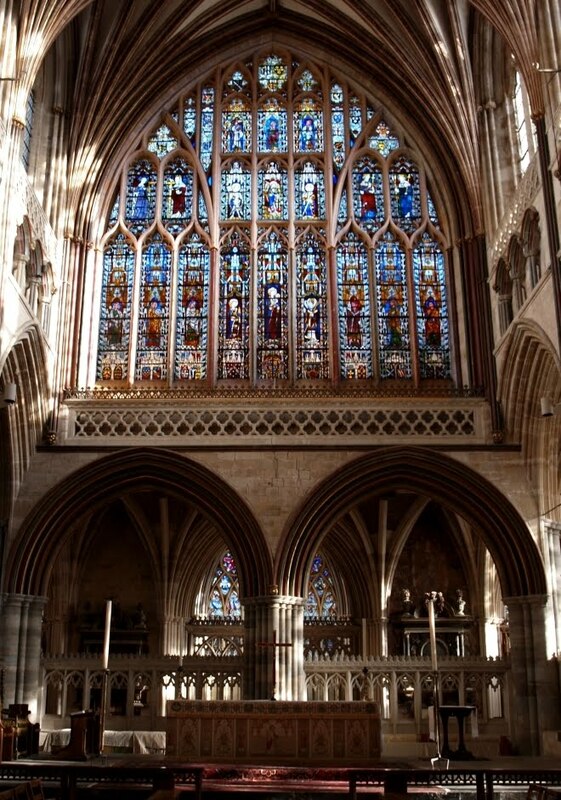 Many of the memorials were shattered along with the medieval side-screen, and much of the Victorian and Edwardian stained glass throughout the cathedral was blown out but the damage was repaired between 1945 and 1953. A perhaps unfortunate attempt was made in the early 1970s to repaint some of the ceiling bosses in the nave but this was abandoned in favour of a more sensitive cleaning operation which revealed traces of the original paintwork. Although most people experience the cathedral via its west front, the finest view of the exterior is probably from the east and the grounds of the Bishop's Palace, which aren't frequently open to the public below. (A Red Coat guided tour does include them though for anyone interested.) From there the bulk of the cathedral and its two flanking towers rises from behind the Lady Chapel in a beautiful series of diminishing pinnacles and flying buttresses. 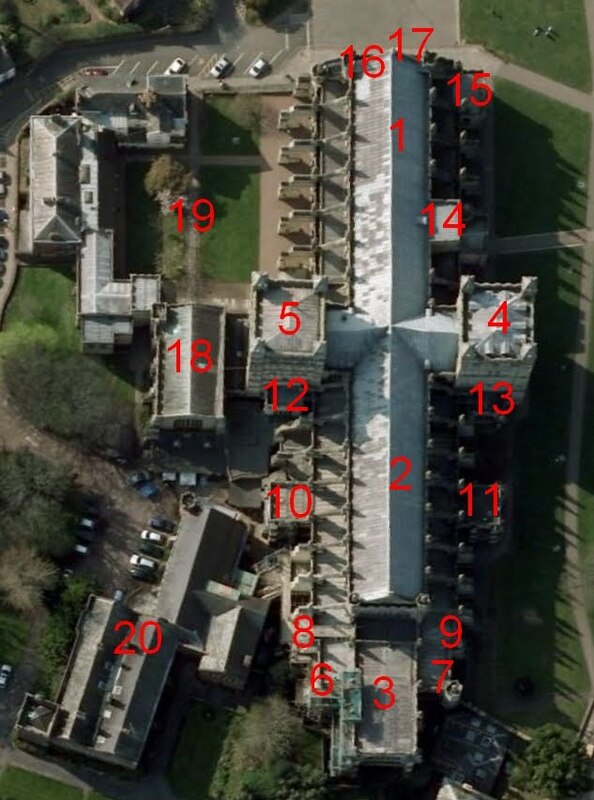 The image above right shows an aerial view of the cathedral with some of the key areas numbered as follows: 1 Nave; 2 Choir; 3 Lady Chapel; 4 North Tower; 5 South Tower; 6 St Gabriel's Chapel; 7 St John the Evangelist's Chapel; 8 Oldham Chantry; 9 Speke Chantry; 10 St James' Chapel; 11 St Andrew's Chapel; 12 St John the Baptist's Chapel; 13 St Paul's Chapel; 14 North Porch; 15 St Edmund's Chapel; 16 St Radegund's Chapel; 17 West Front and Image Screen; 18 Chapter House; 19 Cloisters; 20 Bishop's Palace.